Living in an apartment rental comes with its fair share of ups and downs to be certain. Your neighbors are among the factors that can have the significant ability to either add or detract from your lifestyle if you let them. Though you may not be able to pick who your neighbors are or control their actions once they’ve moved in, there are a few steps that you can take to stay in good graces with them. Read on to discover what they are, and prepare for a great apartment living experience. Sometimes starting off on the right foot with your neighbor is as easy as walking over to their apartment rental, knocking on their door, and breaking the ice! If you’ve just moved in or your neighbors are new, make it a point to take the extra time to introduce yourself. It may not mean that you end up with new best friends, but it can certainly show that your intentions as a neighbor are good. During your first meeting, invite them to speak with you directly if your noise levels or activities ever disturb them. This will imply that you may do the same. Continue your kindness by making a point to say a quick hello as you see them in passing. Keeping things friendly will help to ensure a long and happy neighborly relationship. Being a really good neighbor goes beyond just general niceties. Living in an apartment rental puts you in very close proximity to your neighbor’s space, which should hopefully encourage you to keep an eye out for them. After all, if something shady is going on at your neighbor’s place, it could very easily happen at yours. This isn’t about being nosy, but your neighbor WILL likely appreciate knowing if a package has been removed from their property or their front door lightbulb is blown. Hopefully, they would do the same for you. Parking in an apartment rental complex can be a bit tricky, particularly if you have an onslaught of guests and not a lot of guest spots. Whatever you do, don’t be the neighbor that let’s your guests park just anywhere. Nothing is more aggravating then pulling up after a long day of work and seeing somebody else’s vehicle parked in your spot! Be courteous to your neighbors by parking in your own spots and insisting that your guests do the same. Let’s face it; life isn’t always butterflies and sunshine in an apartment rental. Sometimes your neighbors will get on your nerves, but don’t stress. Rather than allow your aggravation to get the best of you, see this as an opportunity to be proactive and face the situation head on. Before you run directly to your landlord or management company, try to resolve the issue directly with your neighbor. Calmly and kindly present them with your grievance, and offer some solutions that work in the interest of both parties. Taking care of the common areas of your apartment rental is another great way to set a strong foundation with your neighbors. Don’t leave trash piled beside the dumpster or your children’s pool toys strewn across the pool deck. Doing your part to maintain the integrity of your complex is a surefire way to gain the respect of your neighbors. In case you hadn’t noticed, the overall premise of the majority of these guidelines is to lead by example. If you want to have good neighbors, be a good neighbor. Don’t blast your music until three in the morning or turn on the early morning news full volume. Avoid slamming doors or banging on shared walls. Don’t leave stinky trash bags sitting outside of your front door as an invitation for bugs and flies. Be the neighbor that you want to live next to. If something would bother you if your neighbor did it, than just don’t do it yourself. It’s as simple as that. Looking for an Apartment Rental in Hattiesburg? Now that you know how to cohesively cohabitate with your neighbors, it’s time to find your perfect apartment rental! At Hattiesburg Apartments, we have a huge selection of some of the best properties that Hattiesburg has to offer. We can’t wait to help you secure the space that’s perfect for you! Take a look through our database of properties today and contact a team member to start looking for your perfect pad. For many apartment dwellers, life in an apartment rental wouldn’t be the same without a furry friend or two. That being said, many landlords have had the firsthand experience of seeing pets turn into pests, and may be reluctant to allow them. Instead of being part of the problem, learn to be a part of the solution so that your landlord won’t ever have a reason to ban your barking buddy. Read on to discover some easy ways to pet-proof your space. If you know you will be bringing a pet into your apartment rental, play it safe by finding a home with tile or laminate flooring. Rugs will hold onto remnants of any accidents that your pet might have, and real hardwood floors can be easily damaged by nails that need a trim. Not only are these likely to frustrate your landlord, but they may also end up costing you a pretty penny in the form of your pet deposit. If you find the perfect space and it doesn’t meet these criteria, be responsible and purchase an ample amount of throw rugs that can protect your landlords’ floors. Crate training, when done the right way, can vastly improve life in an apartment rental for your dog. In the wild, dogs live in caves and enjoy snuggling up in these spaces that make them feel at home. Incorporate soft bedding and chew toys, and be sure to remove collars before closing a crate. Your canine pal will get a good rest while you are away and in return, you can rest easy knowing they are not destroying your space. If your pet isn’t potty trained, you are likely going to have a big problem in your apartment rental. Puppy pads just won’t cut it! Do the responsible thing and take the time to properly train your pet. Take him/her out regularly to avoid accidents and, if an accident happens, clean it up immediately to avoid long-term damage. Utilize the outdoor space around your apartment rental as much as possible. Nothing is more frustrating than a pet parent who leaves a lonely, yapping dog alone all day for the neighbors to hear. Making sure that your pet is properly exercised is imperative, particularly if they are large and your space is small. Set aside time each morning and afternoon to get out some of their extra energy. Not only will it ensure that they are resting peacefully while you are away, but it may also help you save face with your neighbors! If your apartment rental comes furnished, spend a little extra cash to go get covers for any couches and chairs that your pet might jump up on. Also, make sure that mattresses have a water-proof, protective cover that will keep them safe from fur, odor, and any potential accidents. Dogs are certainly not the only furry friends who can wreak havoc on an apartment rental. Cats have been known to do their fair share of damage as well. To avoid feline frustration, provide scratching posts for any of your kitties who still have their claws. Provide toys that they can play with while they are alone, as a bored cat can often become a destructive cat. Keep litter boxes clean to avoid offensive odors from seeping into the air. You may even consider putting the litter box inside a cracked closet or a laundry room, where errant litter will be less likely to damage flooring or get tracked throughout the apartment. Finally, (and I can’t stress this enough), keep your apartment rental clean when you have a pet. Hopefully it’s something that non-pet owners do as well, but when you have a whiskered roommate, it becomes even more important to stay on top of the cleaning. Pet hair can get sucked up into vents, ground down into carpet, and find its way into cracks and crevices you didn’t even know existed in your space. Failure to clean it up can lead to lingering odors that your landlord definitely won’t appreciate. Now that you know all of the easy ways to be the best pet owner in your apartment rental, you need to find the home that you and Fido can enjoy together. At Hattiesburg Apartments, we’ve teamed up with 17 of Hattiesburg’s most desirable apartment complexes to offer our tenants a great rental experience. No matter what your budget, style, or location, we guarantee we’ve got the right space for you. Take a look through our database of properties today and contact a team member to start looking for your pet-friendly paradise. Cultivating and maintaining a respectful relationship with your landlord or property management company is the key to ensuring that you are happy in your apartment rental for a long time to come! However, life in an apartment comes with an entirely separate set of rules than a single-family property. Not only do you have to be a good tenant, but being that you are in such close proximity to your neighbors, you have to worry about being a good neighbor too. If you follow these simple guidelines, we guarantee that your landlord will feel lucky to have you as a tenant, which will make your apartment experience a whole lot easier! This probably sounds fairly obvious, but non-payment of rental fees and/or late payments, are the leading causes for eviction from an apartment rental. It doesn’t matter if your boss paid you a few days late, or you have the tendency to let important things like paying rent slip your mind. Your landlord doesn’t want to hear your excuses. You are now adulting and you are going to have to take on a whole lot more responsibility if you want to be successful at it. No matter what the obstacles, make sure that your rent is paid in full, on time. Remember that your landlord is running a business, just like any other, and their ability to maintain that business rests on the assumption that tenants will adhere to their lease-bound financial responsibilities. If the lease for your apartment rental states that you aren’t allowed to have dogs, you can’t smoke within the unit, or that you are the only person cleared to live there, don’t rock the boat. Trying to sneak in Fido or allowing a friend to crash indefinitely on your couch is a quick way to break the terms of your lease and potentially face the frustration and anger of your landlord. Not only that, but failure to adhere to the lease terms is also grounds for termination of the lease, which, to put it bluntly, means your landlord can start the eviction process. Be up front and honest in all of your dealings with your landlord. If you have a friend who really wants to take over your spare bedroom, they should do it legitimately. Have your buddy fill out an application form so that he/she is legally added to the lease and your landlord has no need to retaliate. When you live in an apartment rental, your actions directly affect your neighbors. Whether they are above you, below you, or off to either side, thin walls can leave your neighbors hearing, smelling, and experiencing more of your life than they may actually want to. Be mindful of this in all that you do. Avoid storming around your house slamming doors, playing loud music at odd hours of the night, or keeping your television volume on full blast. If you plan on cooking something with a strong smell (brussel sprouts, cabbage, or other equally malodorous fodder), open a window or turn on a fan to prevent the aroma from wafting into your neighbor’s space. A surefire way to tick off your landlord is to be the subject of an onslaught of complaint calls. Treat your apartment rental in the same way that you would treat the home of somebody you look up to and respect. Take time and care to keep it clean, free of odors, and in good repair. Not only is this just general courtesy, but it will also help to ensure that you get your deposit back at the end of your lease term. Unfortunately, damages may occur within your apartment rental, whether due to your own negligence, aging appliances, or other things that are out of your control. Your responsibility as a good tenant is to make sure that these damages are reported quickly to your landlord so that they can be repaired and hopefully not lead to larger issues down the road. For example, if you notice a wet patch on your ceiling that may indicate a small leak, time is of the essence. Report it right away before it turns into a full-on flood! Now that you are familiar with the easy ways to be the type of tenant that every landlord seeks, it’s time to find your next apartment rental! Hattiesburg Apartments is ready to help you locate the space that truly feels like a home you can be proud of! We work with 17 of Hattiesburg’s finest apartment communities, offering our clients properties that meet every budget, desired location, style, and amenities. Take a look at our available properties and reach out to start hunting! One of the biggest woes of life in an apartment rental can be having a roommate that you don’t gel with. It can be tempting to assume that you are open, understanding, and laid-back enough to go with the flow and deal with your roomies quarks, but once you are submerged in a cohabitation situation, you will definitely find out what you are really made of. Let’s face it, we all have pet peeves, whether we like to admit it or not. Living with someone who triggers your anxiety is sure to have a disastrous ending, so avoid the drama by making sure that you and your roommate have what it takes to make it work before you sign a lease together. If you are inviting another party to live in your apartment rental with you, you absolutely want to make sure that you know a bit about them. This doesn’t necessarily mean that you need to run an actual background check, but you should certainly do some digging on your own. With social media as prominent as it has become, it doesn’t take much effort to snoop around and see what type of person your roommate really is. If you’re more of a quiet type and your potential roomie’s social media feed boasts an overwhelming amount of keg stand selfies, it’s something worth taking into consideration. If you find that you have mutual friends through their social media, think about asking around and gauging the overall opinion of your prospective partner. Are they thought to be loud, messy, or irresponsible? These could be red flags. Sharing your apartment rental will require an open flow of communication between you and your roommate. Make sure that you will be able to handle any potentially difficult situations that might arise by starting the conversation early. Before you commit to a roommate take them out for coffee or a meal and get them talking! First off, this will allow you to get to know them better and make your own assessments of who they are as a person. It will also help you determine their ability and willingness to be open and honest with you. Ask a bunch of questions and make it apparent that you are more than willing to answer any that they have for you. Keep in mind that a roomie that clams up any time they are asked a question or who has difficulty engaging in your banter might not be the best fit. Rather than diving headfirst into a living arrangement, invite your potential roommate to join you in your apartment rental for a trial period. Having even just one week together could be an eye-opening experience for both of you. You may quickly realize that yes, this is your ideal roommate, or it could go the other way and become obvious that it will likely not work out. Remember that they have a say in this as well and could also decide that they are unhappy with the living situation too. Being unclear about who pays for what in your apartment rental is a fast way to divide roommates. If you want your new partnership to work, you will definitely have to have the money talk before they move in. If there are additional expenses above and beyond just the rent, you will want to clarify that up front. Roommates are going to be using your cable, electricity, internet, water, and trash services just as much as you are, so if you pay for these separately you will want to have a ballpark figure ready to let them know what they should expect to contribute monthly for them. Sit down with your new roommate and establish a set of rules together for your apartment rental. If there are concerns that either of you still have, this is the time to address them. House rules may be as simple as not leaving dirty dishes in the sink or allowing the contents of your bedroom to spill into common areas. They may also help to set the parameters for noise levels (quiet after 10), guests (only on weekends), or groceries (what’s shared and what’s not). No matter what your rules are, setting them together is a great way to build trust and establish your boundaries from the onset of your roomie relationship. Whether you are flying solo or looking to live with a roommate, finding the right apartment is the obvious first step. At Hattiesburg Apartments, we’ve been helping our clients find their perfect apartment homes for over 35 years. We’ve paired up with 17 of Hattiesburg’s top apartment communities to offer our clients the best that Mississippi has to offer. Take a look through our database of available properties today and contact us to begin hunting! Summer is right around the corner, and for most of us this is a welcome event after a particularly long winter. Summer does, however, have its own set of pitfalls. Between the rising temperatures and the excess moisture in the air causing humidity, keeping your apartment rental cool on a budget can feel like a chore, but it doesn’t have to. We’ve compiled a list of easy tips to follow that will help you keep your home comfortable all summer long without breaking the bank! An easy way to drive up the temperature in your apartment rental is to have a whole bunch of electronics running at the same time! Remember to turn off lights when you are away from home or not in the room. Powering down computers and other devices when they are not in use will help as well. If you use appliances like dishwashers, washing machines, and dryers, run them at night when your home is already cooler. The windows in your apartment rental will greatly affect how much hot air gets in to your space. Keep curtains or blinds drawn during the day when you are at work to prevent sunlight from pouring in and heating up your rooms. If you are home during the day, take advantage of cool winds by opening all the doors and windows to create a cross-breeze that will naturally refresh your home. Believe it or not, your body chemistry could be contributing to how hot your apartment rental feels to you. Keep yourself well-hydrated throughout the day to stabilize your own body temperature. Eating light and healthy is another easy way to maintain your internal thermostat. If you enjoy spicy foods, summer is a great time to partake. Spicy foods cause your body to naturally perspire, which also helps to keep you cool. Additionally, consider trading in your hot morning shower and cup of coffee for a cool substitute. Shower in lukewarm or room temperature water and switch your steaming cup of Joe for an iced alternative to start your day off feeling awake and refreshed. Just because you are in an apartment rental doesn’t mean that you aren’t in charge of some basic maintenance. A dirty AC filter can make a world of difference in the efficiency of your unit. Replacing your filter regularly is imperative to keeping your home cool, as well as keeping your air clean and breathable. Also, make it a part of your regular cleaning routine to vacuum the air vents in every room. As they collect dust over time, air flow is prevented. Did you know that certain plants have been proven to keep the air around them cool through a process called transpiration? Pretty neat, huh? Essentially, this is when the plant releases evaporated water through its leaves in response to rising air temperatures in order to cool itself and its environment down…kind of like sweating for humans! You can utilize this amazing feat of Mother Nature to help naturally chill your apartment rental by inviting some greenery into your space! Some great plant choices to help you achieve this cooling effect are aloe vera plants, areca palms, ferns, snake plants, and golden pothos. Cooking in a small space, such as an apartment rental, is a surefire way to raise the temperature. Rather than insisting on a home-cooked meal this summer, maybe it’s time to get out more! If eating out’s not your thing, consider lighter items such as salads and sandwiches that don’t require the use of your oven. If you’re still feeling like your apartment rental has become an oversized sauna, don’t fret…we still have a few zanier tricks up our sleeves. One involves a basic oscillating fan and a big bowl of ice! Intrigued? Read on. To make this contraption work to your benefit, simply place the bowl of ice in front of the fan on a sturdy table or chair where they won’t get knocked over. Power the fan on high and voila, you have an extra booster for your AC unit, blasting cool air throughout your space. If you’re having trouble sleeping through the heat, we have a solution for that as well. Take your pillow and let it get nice and cool in your freezer for about 20 or 30 minutes prior to going to bed. Put on a pillow slip and place it under the covers to keep you resting comfortably! You’re fully prepared to beat the heat, so now all you have to do is find the perfect place to implement your new skill set! At Hattiesburg Apartments, we are excited to show you properties from 17 of the top-rated neighborhoods in Hattiesburg. Take a look through our database of available properties today and contact us to begin hunting! Why Rent an Apartment in Hattiesburg? In our beautiful country, there are certainly many fine places that you could choose to call home. From the mountainous west, to the rocky shores of the northeast, to the tropical paradise of the far south, and everywhere in between, there’s something here for everybody. So why, you might ask, would you choose to find an apartment in Hattiesburg as opposed to anywhere else in this richly diverse country? Well, here are a few things we think you should know if you are considering a move to Hattiesburg. Originally home to Choctaw Native Americans and thousands of years of their indigenous ancestors, Hattiesburg was colonized in 1763 and officially founded in 1882 by Captain William H. Hardy, who named it aptly after his wife, Hattie. The history of Hattiesburg is rich with stories and, in fact, the Hattiesburg Historic Neighborhood District was named one of the “Great Places in America” to live by The American Planning Association in 2011. An apartment in Hattiesburg means close proximity to the African American Military History Museum, the Mississippi Armed Forces Museum, and the Hattiesburg Area Historical Society Museum, among other historic landmarks that any history buff would find of great interest. One of the great things about finding an apartment in Hattiesburg is feeling the charm of a small town paired with the ease and benefit of big city living. Hattiesburg has a great assortment of shops, nightlife, and entertainment to offer its residents. It also offers access to many convenient public transportation options, such as Amtrak and the Hub City Transit, as well as having Hattiesburg-Laurel Regional Airport easily accessible. One of the things our amazing country has to offer is a hugely diverse climate, and in Hattiesburg you get to experience the best of it all. Deciding to rent an apartment in Hattiesburg will mean warm, rich summers and short, mild winters, with snowfall a rarity. If snow is your thing, that’s okay! You’re also just a few hours’ drive from some great ski resorts in Alabama and Tennessee.If you prefer to stay local, check out the hiking trails, golf courses, and Hattiesburg Zoo, or take a bicycle ride through the city. Here’s something else that you may not know about Hattiesburg…it’s got a pretty booming economy, and you can’t go wrong with that. In fact, recent job growth in Hattiesburg is around 4.28%, with projected future growth of up to 40.67%. That’s 2.69% higher than the national average. That means that renting an apartment in Hattiesburg can offer you some peace of mind when it comes to your financial stability. With the majority of residents making a living working in retail or healthcare, Hattiesburg also has a thriving manufacturing industry which provides 1000’s of jobs across the Pine Belt. Hattiesburg is home to Kohler Engines, Coco-Cola Bottling Company, Pepsi-Cola Bottling Company, and Budweiser Distribution Company, to name a few. If you are an art and culture buff, Hattiesburg has something for you too! With our rich history, there’s something to appeal to everybody. Stop by the De Grummond Children’s Literary Museum, one of our aforementioned history museums, the historic train depot, or any one of the several galleries and theaters scattered throughout the city. If you’re more of a foodie, take a tour of some of the amazing dining options and try some of our delicious local fare. Every meal will leave you fully satisfied that you chose to find an apartment in Hattiesburg. If you’re considering a move to Hattiesburg and you are a student or you are raising a family, our school systems might be of intrigue to you as well. Renting an apartment Hattiesburg means access to six different public high schools, two separate middle schools, and nine private education centers. Hattiesburg is also home to the main campuses of both the University of Southern Mississippi and William Carey University, as well as secondary campuses for the Pearl River Community College and Antonelli College. Looking to Rent an Apartment in Hattiesburg? With so many amazing reasons to make Hattiesburg your home, why wouldn’t you start looking for your perfect apartment today? At Hattiesburg Apartments, we’re sure that we have just the place to entice you even further! Our agents can’t wait to show you around any or all of our 17 local neighborhoods. We pride ourselves on offering the best that Hattiesburg has to offer and we assure that you won’t be disappointed. Take a look through our database of available properties today and contact us to begin hunting! Looking for an apartment to rent can be exciting, daunting, or any combination of the two. Taking your own personal preferences into consideration, while at the same time maintaining a realistic expectation of what type of place you would like to be in is a delicate balance. Before you begin your search, get clear on what is important to you, what is non-negotiable, and where there is wiggle room when it comes to your perfect place. Here are some things you might want to think about! One of the most obvious things you will need to take into account when looking for an apartment to rent is your own financial situation. If you aren’t very clear on your budget, it can be quite tempting to fall in love with something far out of your price range and give in to splurging. While there’s nothing wrong with occasional lavish spending, you’ll probably want to save it for a trip to the mall as opposed to impulsively signing up for a 12-month lease that you can’t afford. Luckily, Hattiesburg has a lot of affordable housing! Look for a place that won’t leave you straining to make ends meet, but be careful not to trade quality for price either. Don’t forget to acknowledge the other costs that may be associated with the property, such as your electric, cable, or internet bill. You’ll know you’ve found the perfect apartment to rent when you are in close proximity to the things that make up your daily life! Being near to the people and places you visit the most will be of utmost importance. For example, if you are a student attending the University of Southern Mississippi or William Carey University, you will obviously want to find a place located close to your campus. If you are raising a family in Hattiesburg, you may want to pay attention to which school district your apartment falls into, or its nearness to parks and recreation. If your day-to-day involves a commute, it will be beneficial to have access to public transportation. With the changing needs of renters over the past decade, apartment rentals have begun to offer tenants a much wider variety of amenities. That being said, when you are looking for an apartment to rent in Hattiesburg you will want to find a unit that offers the type of upgrades that will fit your personal lifestyle. Having things like on-site gym facilities, pools, tennis courts, walking trails, cafes, or clubhouses could end up being the things that make or break your budding romance with your new place. These things could also help you save some money in the long run, as belonging to a gym or club will likely impose additional costs. When it comes to finding the perfect apartment to rent, you will also want to consider your social life. How close will you be to friends and relatives that you spend the most time with? Also, what sorts of things do you do for fun? If you are a night owl or socialite, finding a place that is close to restaurants and clubs may be very important. If you love to shop, find a place that has access to some of your favorite spots. If you’re an outdoor enthusiast, you will want to ensure that you are close to parks and outdoor areas. With so much to do in Hattiesburg, there’s really no end to what you might find! A more overlooked consideration in the search for the perfect apartment to rent is the management team; however, remember that they are an integral part of your rental experience. You will want to find a property with a management team that is friendly, professional, and reputable. Being that they will interact with you on a fairly regular basis, they should treat you like family and give you the feeling of being right at home. You will also want to ensure that they are knowledgeable and experienced when it comes to property management so that you know they are capable of handling any questions or disputes that may arise during the length of your lease. A 24-hour, on-site maintenance team is also a big plus! Looking for an Apartment to Rent in the Hattiesburg Area? At Hattiesburg Apartments, our team of enthusiastic Advisors is ready to help you find the apartment of your dreams in the Hattiesburg area. With our over 35 years of combined experience, we know all the right questions to ask to land you in the home that fits your budget and lifestyle needs. We work with 17 of the top-rated local properties, ensuring a quality apartment living experience for all of our clients. Take a look at our database of properties today and contact us to begin your search! When living in your apartment rental, there are many costs to consider other than just your monthly rent. Between heating, cooling, water heaters, cooking, electricity, and running small appliances, the costs of maintaining your space can add up really quickly. It doesn’t help that Mississippi is ranked the 8th highest when it comes to energy costs per state, averaging a whopping $307 per month for the typical household. It is also ranked the state with the 3rd highest electricity consumption per consumer, a big indication that it’s time to start turning off the lights! If you are one of the many renters looking for ways to cut down on astronomical utility costs, here are a few simple guidelines that can help you to do just that. While you may not be aware of it, there’s a good chance that a simple shift in your timing could save you a whole lot of money on the electric bill for your rental apartment. Throughout the course of the day, public demand for electricity fluctuates, creating peak and off-peak hours where rates are adjusted to accommodate the demand. For example, a hot, summer afternoon will have more people reaching to crank up the air conditioning, creating a greater demand and, therefore, a higher associated cost for electricity at that time. This, then, would not be the time to run the dishwasher, the washing machine, or to turn on all of the fans and televisions throughout your space. Contact your local electric company to determine what the on and off-peak hours are for you. It could save you hundreds per year. Rather than relying solely on electricity to heat and cool your space, use the natural elements of Mother Nature whenever possible. On a cool day, open your curtains and let the warm sunshine filter into your home to provide some comfort. On a warm day, take advantage of the wind by opening the windows to create a cooling cross breeze throughout your rental apartment. If you’re running the air conditioning or heat regularly in your rental apartment, you are surely collecting all sorts of dust and debris in your air filters. Changing these regularly allows the air to flow freely and unimpeded, ensuring that your unit doesn’t have to work extra hard to achieve the same effect. Although this may seem relatively obvious, lights and appliances being left on is likely the number one reason that the utility costs are so high in your rental apartment. Get into the habit of turning off lights and ceiling fans as you leave rooms, maybe even going so far as to put sticky notes at eye level to help keep you reminded. But, don’t stop there! Did you know that unplugging small appliances, phone chargers, hair dryers, and lamps, among other things, when they are not in use can drastically reduce your electricity usage? That’s right! Simply having the plugs inserted into the outlet is costing you money! Imagine that! Investing a small amount of cash in power strips is another way to help reduce that phantom electricity we were just talking about from leaking out into your apartment rental! When you’re not using any of the items plugged into the power strip, simply flip the switch to off and feel your pockets fill back up. Instead of depending on the convenience of modern appliances, such as dishwashers and clothes dryers, roll up your shirtsleeves and dive in. Hand washing your dishes and hanging clothes to dry will have a remarkable impact on lowering the cost of your utility bills. Another way to combat the cost is to bring heavy duty laundering (such as bedding) to the laundromat instead of trying to overstuff the washing machine in your apartment rental. Scraping together a few quarters is a great way to lessen the blow of your electric bill. If you have a good rapport with your landlord, you may take it to the next step and request that they update any old or outdated appliances within your apartment rental. Will this work every time? Not necessarily, but you never know unless you ask. Looking for an Apartment Rental in the Hattiesburg Area? Now that you are privy to all sorts of easy tricks to help keep your apartment living costs down, it’s time to find the perfect space that will act as your new home! At Hattiesburg Apartments, our team of dedicated employees has gone to great lengths to put together a database of only the highest quality apartment rentals in and around the Hattiesburg area. If it’s time to find a place to hang your hat in Hattiesburg, look no further. Contact one of our team members and let’s get looking today! When you’re living in a rental apartment, there are many costs to consider other than just your monthly rent. Between heating, cooling, water heaters, cooking, electricity, and running small appliances, the costs of maintaining your space can add up really quickly. It doesn’t help that Mississippi is ranked the 8th highest when it comes to energy costs per state, averaging a whopping $307 per month for the typical household. It is also ranked the state with the 3rd highest electricity consumption per consumer, a big indication that it’s time to start turning off the lights! If you are one of the many renters looking for ways to cut down on astronomical utility costs, here are a few simple guidelines that can help you to do just that. I think it’s a pretty fair statement to say that not all rental apartments are created equally! Whether you’ve spent a considerable amount of time living in apartments or this is your first go-around, it is obvious that there are some places that just feel more like home than others. But, how do you know for sure that you are getting into one of those places as opposed to the place that looks great during a tour and quickly turns into a nightmare upon move-in? Here are a few tips that can help to keep you on your toes so you don’t get lost in the luster and sign up for a regrettable stay in apartment hell. Your first indication that a rental apartment is of good quality is your interactions with the management team. When you are calling around to set up walk-throughs of your potential new digs, you should expect to hear back quickly. A management team should be eager, ready, and willing to show you around and showcase all of the characteristics that set them apart from the competition. A less-than-enthusiastic acknowledgement of your inquiry could be indicative of a management company that doesn’t put their tenant’s needs first. If they can’t even make the time to show you the property, how do you think it might be handled if your radiator breaks or your kitchen sink starts leaking? Just saying. As you go to tour each rental apartment, it can be easy to get caught up in the thrill of shiny, new appliances and pristine, laminate flooring, but don’t let these decoys keep you from seeing what’s underneath. It’s unfortunately common practice in many cases for those not-so-credible landlords out there to “pretty up” their spaces in an effort to mask bigger, existing problems. Similarly, many will hire “professionals” that do mediocre work simply because they charge less. Pay attention to the smaller details. Is paint sloppily applied or does it look professional? Are appliances installed correctly and in working condition? Check under sinks and behind toilets for signs of leaks or water damage. Getting caught up in the surface-level stuff can make for great aggravation down the line. As with any other type of real estate, the location of your rental apartment is a good indicator of whether or not it is a quality place to live. That’s not to say that there aren’t amazing apartments available in up-and-coming parts of town, but you do need to know where you’re living. Much like was just discussed, sometimes landlords will “fluff” their spaces to make them seem more appealing, all the while forgetting to mention the noise of the nearby train that’s probably going to drive you crazy, the rising crime rates within the community, or the rush hour traffic that is a guaranteed impediment on getting you home before The Bachelor comes on! If you’ve done your diligent inspection of the rental apartment unit and it seems to pass the test, that’s great! However, don’t sign that lease just yet. Ask to be shown the grounds within the rental community. A well-maintained exterior is suggestive of a management team and community of neighbors who take pride in keeping their neighborhood clean and pleasant. If, however, you find a property full of overgrown or unkempt landscaping, free-floating trash and debris, and chipping, peeling paint, you may want to take this into consideration. It is assumed that you will want your new home to feel welcome and inviting and nothing gets you further from that than being greeted with an eyesore every time you drive up to your building. If all of the boxes have been checked and red flags waived, it’s time to start the application process for your new rental apartment. Now, what I’m going to say might seem counterintuitive, but hear me out. The application process should be a bit rigorous. Wait, what? Yes, that’s what I said. A good landlord cares about the people he/she is renting out their property to. They’ve likely put a lot of work into creating a quality renting experience and they should want to maintain that standard. If the application process doesn’t require a background or credit check, you might want to start asking some questions. Now that you know all of the things you need to keep an eye out for as you begin your apartment search, it’s time to get hunting! Using the assistance of a professional, such as those at Hattiesburg Apartments, is another valuable tool to ensure that you don’t get caught signing a lease on a property that ends up to be anything but desirable. Our database of available rentals includes units in 17 of the most desirable and beautiful local communities in the Hattiesburg area. Don’t wait another minute, contact us today! We can’t wait to help you find your new home! It’s ideal to have a landlord that you get along with, but there may still be times in a rental apartment that you two just don’t see eye-to-eye. In that event, you need to keep the lines of communication open in an effort to maintain the positive rapport you have built with one another. Disputes between a landlord and tenant can arise for a multitude of reasons, but handling them in the proper fashion can help to ensure successful arbitration happens quickly. Let’s take a look at some of the more common disputes encountered. No matter how well you and your landlord get along, you have to keep in mind that the lease you signed for your rental apartment is essentially a business transaction. This piece of paper is a guarantee that you will pay a certain monthly amount for the use of the landlord’s space, so it’s no wonder that problems can arise if it is perceived that you aren’t holding up your end of the bargain. Whether your failure to pay your rent was an honest mistake or something else, fix the problem quickly by getting your account current. In the event that the delinquency is an error on the landlord’s part due to a misapplication of your payment, provide your landlord with supporting documentation from your bank immediately to avoid any further implications. As we all know, life in a rental apartment wouldn’t be complete without lots of neighbors in close proximity. While usually this is a positive experience, every once in a while you may be unlucky enough to encounter a particularly offensive neighbor. Your landlord’s failure to remedy a perceived neighborly conflict in a manner that feels acceptable to you can cause quite a lot of tension between you. If you feel that a legitimate complaint is not being taken seriously, request a face-to-face meeting with your landlord and discuss your perspective openly, calmly, and respectfully. Chances are that he/she didn’t fully understand the magnitude of the situation, so give them a fair opportunity to make it right now that they do. Problems can arise quickly between a landlord and a tenant if a rental apartment is not in proper working condition. From faulty kitchen appliances, to drafty windows and doors, to broken HVAC systems, the list of things that can go wrong in any home is a long one. Typically, it is a landlord’s job to make sure that the space they are providing you with is in an adequate state of repair (unless otherwise specified in your lease). Read through your lease to determine the proper procedure to report any necessary repairs. If the process is not sufficiently outlined, reach out to your landlord and ask them what they would like you to do. Typically, a landlord will have a handyman or technician on call to complete the task within a reasonable time frame. If your landlord repeatedly refuses to make the needed improvements, you may want to look into your rights as far as ending your lease early or if that fails, contact whatever governing authority can help put an end to your grievances. Common Area Maintenance (commonly referred to as CAM) can also become a point of contention between the tenant in a rental apartment and the landlord. Much like above, remember that your landlord can’t possibly be aware of the problem until you bring it to their attention. Rather than allowing your issue to fester, approach them calmly about the branch poking your screened-in patio or the broken paver you are constantly tripping over. This is probably enough to get them working on it, particularly because they have a vested interest in their property and will assume liability if anybody is seriously injured. What happens with the security deposit you were required to put down when you signed the lease on your rental apartment? If you feel that your deposit is being unjustly held, chances are good that you are none too happy about it. Avoid this situation by carefully reviewing your lease at the start of the term to be clear on what is expected from you as a tenant. Make any necessary repairs prior to move-out and request a walk-through with your landlord so that they can point out anything you may have missed. If you still feel that you deserve your deposit back, write your landlord a letter documenting why and provide evidence in the forms of pictures of the space post-lease. If the situation furthers, you may have to be willing to appear in court to defend your position. The search for your perfect rental apartment should be fun and exciting. Work with an expert who knows the area well and can help you find the space that best suits your needs. At Hattiesburg Apartments, we offer our clients a huge database of quality properties ready to view. Contact us today to get started! Although it may not feel like it quite yet, the warm weather is just around the corner! That means it’s a perfect time to start to invite some new, brighter energy into your apartment rental. Putting a plan into place to declutter, clean, and organize can help to lift your mood from the depths of winter weariness to the sunshine-filled horizon of spring and summer! Your apartment rental has likely been closed up like an air-tight submarine in an effort to keep the cold, gloom, and snow of winter at bay. This also probably means that you’ve accumulated a few layers of unwanted dust on many surfaces. Start at the ceiling and work your way down to the floor, dusting every surface you come across. Don’t forget fans, light fixtures, heating vents, shelves, pictures, TV’s, and computer screens! Even though you still may not love what you are seeing outside, paying a little extra attention to your windows is a great way to liven up your apartment rental. Clean both the inside and outside (if accessible) of your windows with a streak-free glass cleaner. Launder or spot treat window treatments, dust blinds, and wipe down sills with a wet sponge. You will be left with a clear path to let the sun shine in! Your bed is a common hibernation spot in your apartment rental throughout the winter months, so shake things up by shifting the energy in your bedroom. Wash all of your bedding, maybe even adding a few drops of citrus or flowery essential oil. Flip your mattress and spray it with an essential-oil infused mist or an odor-remover (like Febreeze) to freshen it up. You might even invest in a cheery, bright, new comforter or duvet cover that will make it feel more like spring every time you enter your room. If you have mounds and mounds of clothing that you don’t wear taking up space in your apartment rental, now is a great time to purge! Go through your drawers and closets (linen closets too) and start making some space! The dress you’ve been holding onto since high school in the high hopes that you will one day fit into it again? Maybe it’s time to move on! Find a donation drop-off near you and let go of clothes, books, shoes, linens, and anything else that is simply adding to the clutter. The bathroom in your apartment rental can quickly become a cluttered mess as lotions, potions, makeup, cleaning solutions, hair accessories, and hygiene products are shoved haphazardly into any available storage. Time to fling open the cabinet doors, dump the baskets, and upend the drawers! Look for expired medicines, prescriptions, makeup, toiletries, and anything else that seems to be taking up space rather than serving a purpose. Finish it off by spraying down the storage spaces with a gentle cleaner and reorganizing whatever is left! As your apartment rental sits closed off from the outside during the winter, the more absorbent surfaces in your home are clinging onto all kinds of odors, dust, and dirt. Give these surfaces a deep-cleaning, first vacuuming and then shampooing carpets, couches, loveseats, throw rugs, and any other places where the winter blues might be trapped. Locate all of the places you’ve been stashing your paperwork throughout your apartment rental and commit to getting it organized. Throw away expired coupons, shred documents you no longer need, and toss old magazines and newspapers you’ve been holding onto. One of the most daunting places to clean in an apartment rental is the kitchen, but think of how good it will feel when it’s done. Re-organize cabinets (yes, even the dreaded Tupperware cabinet), and throw away expired food and spices. Empty your refrigerator and wipe down all of the shelves and drawers. Scrub out the oven, microwave, and even the dishwasher. Don’t forget to pull the stove out so that you can clean up any trapped food particles and dust that have potentially gotten stuck there over the winter. Bleach out garbage cans to freshen them up for the coming season. With spring comes a new beginning! If your new beginning includes finding a new apartment rental in Hattiesburg or the surrounding areas, check out the selection of quality, affordable apartments offered by Hattiesburg Apartments. Our properties offer a variety of amenities, professional management teams, and the stylish living that you desire. Add to that our teams nearly four decades serving the Hattiesburg community in the search for their perfect home, and you have created a recipe for success. Contact Hattiesburg Apartments today to get searching! If you’ve decided that finding an apartment in Hattiesburg is on your to-do list, congratulations. With so many awesome things to do and awesome people to do them with, Hattiesburg is a great place to make your future home. Apartment hunting anywhere can be loads of fun, but doing so blindly can turn it into a nightmare relatively quickly. Keep your head above water by learning some of the more common red flags to be wary of as you start your hunt. You’ve been scouring the internet and you’re pretty sure you’ve found the one! You eagerly dial the number and leave a message to schedule a property tour. Days pass and you hear nothing so you try again with the same result. If you’ve been trying and failing to get a hold of a property manager while searching through apartments in Hattiesburg, chances are good you should keep looking. If they are this difficult to get a hold of just to see the property, imagine what it might be like if there is a maintenance issue or other problem while you are living there. Once you’ve scheduled the tour for your apartment in Hattiesburg you are probably going to feel pretty eager to check it out. Verify that you are being shown the actual unit you will be potentially living in, rather than a “model” home or “similar property”. Failure to offer full disclosure could be indicative of issues within the unit. Also, notice if you are feeling rushed by the landlord as opposed to them letting you take your time to peruse the property at your own pace. If it sounds too good to be true, it probably is. Apartments in Hattiesburg should fall into comparable price ranges, give or take. To locate a property asking well below the market rate of similar apartments in the area may not be the lucky break you think it is. Oftentimes this type of a “deal” marks a scam, an illegal apartment, or a very poorly maintained site. If the landlord at your new place seems more than willing to hand over the keys without a proper credit check, background check, or application process, you may be entering into shady territory. The majority of legitimate apartments in Hattiesburg will follow the same basic application process to ensure that they know who they are renting to. These will typically involve an application fee, a background check, and/or a credit check. As you tour apartments in Hattiesburg and the surrounding areas, pay attention to the maintenance of common areas and individual units. If you’re running into “out of order” signs at every turn, you may want to pay attention. Similarly, notice if there are several construction projects that seem to be underway on the property. Both of these can indicate a property manager or landlord that may not be diligent about handling your complaints or getting issues fixed in a timely manner. Unfortunately, people can be really smelly, and sometimes this transfers into their homes. If the unit you are touring is infiltrated by an offensive odor, this could become a permanent part of your day to day. While some odors will leave the property with the current tenant, others will linger for undisclosed amounts of time and no amount of incense, air freshener, or scented candles will get them out! Some types of odors can also be suggestive of a much larger problem, such as mold or rot. Regardless of its origin, a strong stench can be a big impediment on loving your new home. If you are informed that you will need to get a post office box as a part of your stay, you may want to double check the legitimacy of your landlord. Oftentimes, this can indicate that a building is not actually licensed or permitted for apartment living. All apartments in Hattiesburg are required to have a certificate of occupancy, so typically just asking to see this should be enough to alleviate any concerns. Looking to Tour an Apartment in Hattiesburg? Now that you know what to keep your eyes opened for, it’s time to get searching! At Hattiesburg Apartments, we want to help you find the apartment that’s right for you and, as our name suggests, we are the experts in the area. Our database of available properties includes listings from 17 trusted apartment rental complexes within the area. With nearly four decades of experience helping our clients find home, we are certain that one of our beautiful, affordable properties will be the right fit for you. Contact us today to get started! When you are looking for an apartment to rent, there are so many things you need to consider. With so much to think about, oftentimes very basic necessities are overlooked, leading to disappointment after it’s too late and your lease is already signed. This is especially true if you are a first-time renter. It’s easy to get caught up in the excitement of finding your own place and forget to ask pertinent questions that could greatly affect your long-term happiness in your property. To help you avoid this pitfall, we’ve put together a list of things you should think about as you get started on your search. When deciding which apartment to rent, you will want to pay close attention to the size of the unit. It can be tempting to fall in love with a space without considering factors such as how your furniture will fit in or whether or not you will be comfortable with guests walking through your bedroom to use the unit’s only bathroom. Will the unit be able to accommodate your belongings and your personal needs? Is there enough storage to house items that aren’t used daily? If you commonly entertain, is there enough space to comfortably fit all of your guests? Try to look beyond the hardwood floors and stainless steel appliances to get a better gauge of how the size of the space will work into your lifestyle. Looking for an apartment to rent can get confusing quickly if you aren’t sure about where you want to be, particularly if you are moving into a city that is new to you. Take the time to get very clear on what your priorities are when seeking a space. If you are a socialite, you will likely want to be closer to restaurants, clubs, and bars. If you are an outdoor enthusiast, maybe you would prefer a space in close proximity to parks, trails, or other outdoor activities. If you have a job that requires a lot of travel, you will want to make sure that you have easy access to airports and public transportation. Navigating these things prior to move-in is sure to make your transition into your new space much easier. Although this may seem a bit more obvious, cost is not always the first thing prospective renters look at when searching for an apartment to rent. In fact, renters can be quick to forget the parameters of their budget when they find the perfect space, which can lead to big problems down the line. Even if the actual monthly rent is well within your budget, make sure that you are clear on any other costs that will be associated with the property. If you will be responsible for the payment of utilities, parking, and/or maintenance fees on top of your rent, this could greatly affect your bottom line. If you are a pet owner, getting clear on a unit’s pet policy is imperative to finding the perfect apartment to rent. Don’t just ask if animals are accepted, ask about weight and breed restrictions, pet deposits, and leash and clean-up policies. Failure to understand the bylaws regarding your critter could thwart the whole process of getting into your desired space. Many apartments will require documentation from a licensed veterinarian showing the size and breed of your pet, as well as ensuring that he/she is up to date on vaccinations. Have all of this paperwork ready to go. These days finding the perfect apartment to rent has a lot to do with the amenities that are available onsite. Know what your non-negotiables are before starting your search. If your day isn’t complete without a workout, you may be looking for a space with an on-property gym. If you are an avid swimmer, maybe the absence of a community pool will be the thing that breaks the deal for you. Don’t just think recreation either. Amenities include laundry facilities, balconies, and community rooms too, among other things. Finally, remember that finding the perfect apartment to rent isn’t limited to what’s inside your four walls. Check out the community grounds to see what else is offered. If you have a pet or enjoy exercising outdoors, are there trails or green spaces available? Is the landscaping visually appealing and well-maintained? Are there outdoor common areas for grilling or socializing? Searching for an Apartment to Rent in the Hattiesburg Area? Now that you have a better idea of what to look for as you begin your search, it’s time to start perusing properties. At Hattiesburg Apartments, we offer a wide variety of high-quality apartments in the area to our clients. Take a look through our database today and contact us to get hunting! We’re excited to help you find your new home. Being a pet owner can make the act of searching for the perfect apartment rental a little harder if you’re not sure what landlords and leasing companies are expecting from you. Even pet-friendly communities often have a lengthy list of rules and regulations targeted towards Fido. Build rapport with your landlord by exceeding their expectations when it comes to your pet. Following this list of simple suggestions can help you earn the respect (and testimonies) of your current landlord so that each subsequent rental becomes easier and easier. Every different apartment rental will adhere to their own set of policies when it comes to regulating their pet tenants. Read through the fine print prior to signing a lease so that you don’t unexpectedly find your pup exceeds the weight limit or is among the restricted breeds on the premises. Ensure that you have all of the proper documentation that might be required prior to signing the lease on your apartment rental. A quick visit to the vet to get your pets up to date on vaccinations, declawed (if necessary), and/or spayed or neutered can help to significantly expedite the application process. If you have an animal that may be left for longer periods of time in your apartment rental, appeal to your landlord by letting them know your critter is crate trained. This may help to reassure them that you are looking out for the well-being of the property, as well as your pet. Chances are good that you won’t be the only tenant within your complex that keeps an animal. If you have a pet that will be exposed to your neighbors and their animals, make sure that you spend some time socializing them to minimize the potential for chaos. Keep your dogs leashed at all times when outside of your apartment rental. Even if you know your pet is super friendly, be courteous by remembering that your neighbors may not be so eager to meet your furry friend. Keep plastic bags handy to clean up after your pet as well. Leaving your pet in an apartment rental all day is sure to result in some pent up energy. Make time each day to spend exercising your pet. Not only is this a great way to fortify the bond between you, but it also helps to ensure that your beloved friend isn’t terrorizing your neighbors all day while you are at work. Nothing is quite as frustrating when living in an apartment rental as being subject to listening to a barking dog. The walls in most apartments are not only thinner, but shared. Be thoughtful of your neighbors by paying attention to your dog’s tendencies. Even if your pet isn’t prone to yapping while you are at home, you don’t know how he/she may act when you’re away. Check with your neighbors to see if there is a problem and if there is be proactive by getting it under control. Contact your local pet store or a trainer who can give you some pointers or invest in a pain-free option such as an ultrasonic sound machine. These can be purchased for well under a hundred dollars. Show respect to your landlord by making every effort to pet proof your apartment rental. Cover floors that may be easily scratched with throw rugs. If you are renting a furnished space, protect furniture by covering with blankets or couch covers. Use baby gates to prevent entry into any rooms that should be marked off limits. Keeping your pet clean and groomed will facilitate the same in your apartment rental. Pet dander can, over time, build up to create odors within your space that won’t easily go away. Pet fur can also get sucked into air vents, causing your unit’s HVAC system to run far less efficiently. Avoid losing your pet deposit on your apartment rental by ending your lease with the space looking as good as it looked when you first moved in. Hire a professional cleaner to come in prior to your walkthrough with your landlord. If there are marks or stains that have been there since before you moved in, make sure that you document these at the start of your lease to avoid any problems down the line. Ask your landlord to write a reference for you upon lease completion. If you and your pets are looking to relocate, contact us today at Hattiesburg Apartments. We pride ourselves on having a huge selection of high quality properties that are sure to make you and your furry friends feel right at home. It’s been a long winter, and unfortunately, it doesn’t seem like it’s going to be over any time soon. When you’re living in a rental apartment, knee deep snow and frigid temperatures can keep you cooped up in a small space for a long amount of time, making it easier to succumb to the winter blues. Here are some creative ways to make sure that you keep up your mojo even as Mother Nature continues to threaten with chilly winter weather. One of the best parts about life in a rental apartment is that you are constantly surrounded by other people to help pull you out of your funk. If you’ve found yourself engulfed in gloom, go rap on a few doors and make some new friends. Consider hosting a potluck dinner, cocktail party, game night, or movie night. Chances are good that your neighbors are feeling a bit antsy as well, so you are really doing everybody a big favor. While your rental apartment may be a bit on the small side, there’s still a whole world waiting outside your door. Don’t let a little nip in the air deter you from bundling up and getting out in nature. Going for a brisk walk can really help to boost your mood. If you’re lacking motivation, offer to walk an older neighbor’s dog (unless, of course, you have your own). Your rental apartment is unique from a single family home in many respects, one of the more positive of which is your access to different amenities. Don’t use winter weather as an excuse to put off your exercise routine. Revisit the New Year’s goals that you set for yourself and then get moving! Working up a sweat is an excellent way to boost your mood by increasing both the production and release of serotonin throughout the body. Use on-site gym facilities, indoor basketball courts, or indoor pools to your advantage. In a world that’s constantly on the go, maybe Mother Nature is trying to get us to slow down with these colder snaps of weather. Cozy up in your rental apartment and give yourself permission to lay low for a while. Turn off your cell phone, make a cup of tea or cocoa, grab a comfy blanket and a good book and let yourself zone out for a while. You deserve it. If being penned up in your rental apartment is causing you to go a little stir-crazy and relaxing is not an option, use this time indoors to clear up any clutter that might be adding to the heaviness of the space. A clear, clean space has been proven to help ease tension and relieve a scattered mind. Think of it as an early spring cleaning! Remove disorder by clearing out drawers, cabinets, closets, and freeing up counter space. Donate unwanted clothes and items to a nearby thrift shop. Nothing soothes a heavy heart much more than natural light. If the damp days of winter are treading on your joy, open the curtains and shades and let the sunshine pour in to your rental apartment! Place green plants or vases of flowers throughout the space to remind you that spring is just around the corner. You may even consider opening the windows for a brief period to let some of that crisp, winter air freshen up the stagnancy of an apartment that has been closed up for months. Staring at the walls of your rental apartment day in and day out can certainly lead to the winter blues. Get out of your funk by letting your imagination go somewhere else. Even if you aren’t planning on actually taking a vacation, plan a pretend one. Peruse websites, buy travel catalogues, and watch the Travel Channel. Surrounding yourself with images and thoughts of sandy beaches, warm sun, and tropical cocktails is a surefire way to brighten up your mood. What you put into your body has a direct correlation to your mental state. Stock your rental apartment with healthy, natural foods such as fresh fruit, vegetables, whole grains, and herbal supplements. Drink plenty of water to aid in digestion. Keeping your body in balance will play a key role in warding off cabin fever. Searching for Rental Apartment in the Hattiesburg Area? What’s another great way to fend off the winter blues? Go on the search for your next perfect rental apartment! If you are in the market for a new apartment, Hattiesburg Apartments has a huge selection of top-quality rentals to offer. Our 17 different communities offer spacious floor plans, convenient amenities, and premium finishes that are sure to make apartment living anything but dreary. Check out our property database and contact us today to get searching! When you move into an apartment rental, you are typically asked to shell out a whole bunch of money. Coming up with your first and last month’s rent is hard enough, but add in a security deposit (which usually equals a full month’s rent) and you are looking at quite an investment. Knowing that you are going to get this money back at the end of your lease can add some security to the transaction, so make sure that you are taking the necessary steps to protect your cash. Prior to moving into your apartment rental, read the lease very carefully, particularly the part on what your security deposit covers. Each landlord will have their own guidelines on what is considered “normal wear and tear”, so don’t just assume that the rules are the same as your last place. If it isn’t specified in your lease, take the time to discuss it with your landlord and have him/her amend the lease so that there is no grey area at the end of your lease term. Before you start filling your apartment rental up with your things, ask your landlord to take a walk through the space with you. Meticulously check each room for damages and document anything you find. Take pictures as well. Put all of your observations in writing and have both parties sign it. This will protect you at the end of your lease. If it’s not clearly outlined in your lease agreement, make sure that you ask the landlord before you put holes in the wall or paint your apartment rental. Your landlord may say that it’s fine, but that you will be the one responsible for patching and/or re-painting later down the line. Knowing this can help you to avoid a mistake you might have trouble fixing. The floors of your apartment rental are often overlooked when it comes to your security deposit. Common spaces within your apartment are sure to have more traffic (which may seem obvious), but that doesn’t mean your landlord isn’t expecting you to take good care of them. Cover carpet and wood floors at entrances or in common areas by using decorative throw rugs and runners. This will help to minimize wearing of carpet fibers and scratches to laminates and hardwoods. Cleaning your floors regularly will also help to keep them looking their best. If your apartment rental comes furnished, cover furniture such as couches and chairs as well. Inviting forty people into your apartment rental for a wild party is a pretty sure-fire way to incur some damages. Be considerate of the space by keeping social gatherings small and intimate. Let your guests know of any ground rules you may have (like taking their shoes off at the door or not smoking) prior to having them over so that everybody is clear on the expectations. If you want to make sure you get your apartment rental deposit back, keep the place clean! I don’t just mean the mad dash at the end of your lease to make the place sparkle (although giving your space a thorough cleaning at the end of the lease is also recommended). Rather, keep it clean throughout the duration of your lease. Regular cleaning will help to prevent stains and other damage. Coming to the end of your apartment rental lease isn’t always as simple as just packing up and moving out. Doing this without talking to your landlord could leave you wondering why you haven’t yet gotten your deposit back. Just as you did at the start of your lease, request that your landlord come and do a walk through with you, this time to advise you if anything he/she sees will affect your ability to get your deposit back. Doing this at least a month prior to your lease end will give you ample time to make any necessary repairs without rushing. It may seem redundant, but once your repairs have been made, request that your landlord come back once more for a final walk through of the apartment rental. Have a checklist ready showing them that the requested repairs were made and have them sign off on it before you part ways. Now that you know how to handle your deposit from start to finish, it’s time to find you the perfect apartment rental. At Hattiesburg Apartments, we are eager to make the process fun and exciting. Our enormous database of quality properties is waiting for you to take a look and find your new home! Visit us today! Searching for the perfect apartment rental can be a somewhat daunting task. Let’s say that you find a unit that checks lots of boxes on your wish list; prime location, monthly rent that meets your budget, and lots of natural light. It all looks great on paper…and then you enter the unit only to find a kitchen straight out of the Brady Bunch. Don’t let a less than aesthetically pleasing atmosphere take the attention away from the stuff that makes this place great. There are lots of easy fixes you can do yourself to modernize your new space and make it feel like home. It’s said that the kitchen is the heart of every home, so why should your apartment rental be any different? Even the most horrendous kitchen can be transformed into a warm and inviting space with a few simple fixes. Appliances: Give outdated appliances a facelift by purchasing stainless steel contact paper. For about five dollars you can cover an entire refrigerator. It will make such a difference that your landlord may even ask you to leave it up! Backsplash: Adhesive tiles are becoming more and more popular, which means a greater variety of styles and colors for you to choose from. Not only will this help to update the kitchen, but it also makes for a simple way to change the look anytime you want! Cabinets: Consider using contact paper on antiquated or dingy cabinetry to give it a fresh look. Replacing drawer and cabinet pulls is also an inexpensive way to achieve this same effect. You may even want to consider removing the cabinets altogether for a bright, open, modern concept. Countertops: Hide ugly countertops by laying out pretty wooden cutting boards. Minimize clutter on the counter to draw your guest’s attention elsewhere. If your landlord is a real stickler, simply painting your apartment rental may not be an option, but don’t worry. There are many other simple things you can do to draw attention away from bland, boring wall spaces. Removable Wallpaper: Much like adhesive tiles are growing in popularity so is removable wallpaper! With so many styles to choose from, it’s easy to add a pop of color and texture to any room. Art Gallery: Create a visual centerpiece on a dominant wall by neatly arranging a collection of your favorite art or pictures. Shelving: Add open shelving where you can display pictures, vases, and other decorative items. Although you will likely need to use screws, removing them at the end of your lease is fairly easy and holes can be patched and sanded quickly. Mirrors: Include large mirrors on walls that will not only act as a focal point, but also make rooms look bigger. Another cheap and easy way to modernize your apartment rental is by temporarily replacing the fixtures. Lighting: Remove overhead light fixtures and replace with ones in your own style. Hold on to the originals for the end of your lease. Bathrooms & Kitchens: Replacing rusty, leaky, or ugly faucets and showerheads is relatively cost-effective and simple. Doorknobs: Replacing standard door knobs with fun, funky, and artistic ones is a great way to flaunt your style without breaking the bank. The list of ways to revive your apartment rental could go on and on, but there are a few more miscellaneous fixes that you absolutely must know about. Faceplates: For next to nothing, you can go to any hardware store and purchase new faceplates for light switches and electrical outlets. It’s amazing how big of a difference just this simple thing can make. For a few pennies extra, you can invest in oversized faceplates that will hide drywall and paint imperfections around the outlet. Clean Up: Sometimes rejuvenating your space is as simple as giving it a good cleaning. Use your elbow grease to scrub away stains in tubs, sinks, and toilets, get pesky marks out of carpeting, and freshen up windows to allow natural light to pour in and create a warm atmosphere. Windows: Remove cheap blinds that may make your apartment rental feel more like a hotel than home. Replace with drapes that will compliment the rest of your décor. Invite the Outside In: Add a little life to your space by bringing in some greenery. Consider buying or building window boxes where you can plant herbs, or just scatter vases of flowers or low-maintenance plants throughout your home. Now that you know how fun and easy transforming an apartment rental can be, it’s time to find your new home. At Hattiesburg Apartments we offer our clients a vast array of quality properties to choose from. Our experienced team is here to help you find that space that checks off all of your boxes and we are excited to begin the search with you. Check out our huge selection of properties today and contact us to get started. When it comes to your apartment rental, you may be feeling frustrated with the apparent lack of options available to childproof your unit. With so many potential limitations put into place by landlords about what can and cannot be changed, it may feel impossible to find the right home that will help to ensure the safety of your young ones. However, childproofing your apartment may not require all of the drilling and damage that you might think. There are many simple tricks and easy solutions to help you feel safe and secure in your new home. The easiest way to ensure that your apartment rental doesn’t pose unchangeable threats to your child’s safety is to know what needs to be changed before you commit to signing a lease. As you move through your apartment hunt, be on the lookout for falling hazards, such as balconies with large gaps in between the rungs or open staircases that may be too wide to accommodate a gate. Check for the presence of proper safety equipment onsite, such as smoke detectors, sprinklers, and fire extinguishers. If the property was built prior to 1978, do your research to ensure that lead paint has not been used. Oftentimes this can be identified by the presence of chipping or flaking paint, particularly around windows and doors. Talk to your landlord openly about any concerns that you may have and discuss possible solutions prior to moving in. When you’ve completed the first step and found the perfect apartment rental for your family, it’s time to start finding cost-effective and landlord-friendly ways to further childproof the property, starting at the entrance. Once your toddler is tall enough to reach the door handle, chances are good that they will want to try to open it. Be a step ahead by investing in some plastic door knob covers. This may not work in every situation, being that some apartment rentals have oddly shaped handles. If that’s the case, talk to your landlord about installing a chain lock or invest a little extra for a door alarm which can be mounted with adhesive for minimal damage. Plastic outlet covers can be found at almost any convenient or hardware store and will add a great deal of safety to your apartment rental. For items that will stay plugged in, such as televisions and floor lamps, consider looking for combination outlet and cord covers. Whether it is to keep a child out of a particular room or to prevent them from falling down stairs, a baby gate is a necessity when childproofing your apartment rental. To decrease damage to walls and door casings, use a pressure-mounted gate that will adjust easily to fit most openings. If you are using the gate to block off stairs, however, you will want to talk to your landlord about installing a gate that screws into the wall. This will help to prevent your child from pushing it down. Another affordable and simple option is to consider the purchase of a kiddie corral which will help to keep your child out of harm’s way and restricted to a certain area for short periods of time. Make sure the furniture within your apartment rental is stable and sturdy and remove heavier items from upper shelves. You may even consider bolting furniture to the walls (with permission of your landlord) in case of climbing or pulling. Many of the biggest child dangers in your apartment rental can be found within your cabinets. The easiest way to prevent interaction is to rethink your storage options. Keep chemicals and other hazardous materials up in higher shelves or stored up high in your laundry room, opting to keep items like Tupperware and paper goods stored lower. If space is cramped and that’s not an option, you can purchase adhesive style locks that require no screws or, if your cabinetry has handles, plastic locks that attach to the pulls. Window safety is another important factor, particularly if your apartment rental is on an upper level. Minimize the possibility of an accident here by keeping windows locked. Additionally, move furniture away from windows to prevent climbing and keep long cords for window coverings out of reach. You may also choose to invest in a window guard, which will require your landlord’s permission, as drilling is necessary to install these properly. If you and your family are ready to find your perfect apartment rental, start with Hattiesburg Apartments. Our experienced team will go above and beyond to ensure that your next apartment rental is the last one you will need for a long time to come. Check out our huge selection of properties today and contact us to get your search started. If you are on the hunt for an apartment rental, you may have heard the term “luxury apartment” thrown around here and there and wondered just what that is. The word luxury means something different to everybody, leaving this broad term rather open to interpretation. Pair that with the fact that what is considered luxurious in one market may be thought of as complete overkill in another, and you may be left feeling even more confused. While it’s true that there is no one, concrete definition to describe a luxury apartment, there is certainly a spectrum of guidelines that can be agreed upon as giving a tenant an upscale apartment rental experience. Walking into your apartment rental should make you feel comfortable and at home, which is why developers of luxury apartments have gone to much greater lengths to create a warm and inviting space. These apartments are likely to be either newer construction or newly renovated and updated, featuring all sorts of upgrades. Prospective tenants should look for things such as spacious floor plans, premium wood or tile flooring, top of the line, stainless steel appliances, high end cabinetry and countertops, bigger closets, and high ceilings that are accentuated by lots of natural light. Most apartments will have access to some sort of outdoor space, whether that be a ground-floor patio or a balcony. Developers have also probably given much more attention to the smaller details, such as higher baseboards, modern crown moulding, and taller doors and windows. Entry into a luxury apartment will give you the impression of a clean, modern, open, and airy space. If you don’t feel safe in your apartment rental, you’ll never truly be able to enjoy the space as it should be enjoyed. Planners focusing on luxury apartments have most likely acknowledged this fact and put far more effort into making their tenants feel a greater sense of security. Many of these communities may be gated, either with 24-hour security guards or not, and many may also employ doormen at the entry of the building. Key fobs and swipe cards may be implemented in place of traditional keys and locks, ensuring far greater difficulty to any potential intruders. When you are looking for a luxury apartment rental, there is a good chance that you will be focusing on what sorts of services they offer to their tenants. The majority of luxury complexes will provide a 24-hour concierge service to help with tasks ranging from calling a taxi cab to arranging a house cleaning service. Additionally, these places may offer services such as bellman, valet services, dry cleaning pick-up, and even onsite cleaning services offered for an additional charge. There will also typically be an onsite maintenance person or crew working around the clock to deal with any unforeseen problems that may arise. If you are in the market for a luxury apartment rental, dream big, because when it comes to amenities, the possibilities are truly endless. This is where a lot of wiggle room comes in as to defining what it is exactly that makes an apartment complex luxury. While some luxury complexes may offer amenities that seem average or normal, such as on-site laundry services, exercise rooms or gyms, or outdoor grilling areas, others may take it to a whole different level. Luxury apartment complexes have been known to feature onsite restaurants, rooftop lounges, oversized pools, poolside bars and dining services, spas, computer labs, wireless internet service, and amenities that speak to the sports enthusiast, such as volleyball, tennis, or basketball courts. The sky’s the limit here, and amenities will typically coincide with activities that are popular within the age range and geographic location of the target market. As with any sort of real estate, location is a key factor. A luxury apartment rental is no different. Luxury complexes will typically be found in locations with a denser population and in areas that will offer their tenants the most convenience. These apartments will have access to public transportation and airports, as well as greater proximity to nightlife, shopping, and restaurants. A tenant in a luxury apartment will have a tough time getting bored. If you are looking for the perfect apartment rental to call home, visit us at Hattiesburg Apartments. We’ve been a trusted name in property management within the community for nearly four decades, and our unparalleled commitment to our clients is what keeps us going strong. Take a look at our database of quality properties in the area and get your search started today! Your apartment rental will be your home for the duration of your lease, so it’s important that your space offers a warm, comfortable, and inviting feeling to both yourself and your guests. There are so many simple details that you can incorporate within your apartment to give it a whole new vibe, and the best part is, it doesn’t have to cost you an arm and a leg. Consider some of the following options to create a space that will be remembered by your guests, and keep you loving your apartment rental for the length of your stay! The feeling your apartment rental emits, begins at the entrance. Make your guests feel welcome and invited by paying a little extra attention to detail here! Find a welcome mat or a door hanger that suggests your guests should feel free to make themselves comfortable within your space. If it’s allowed, you may even consider painting your front door a warm and inviting color. When somebody walks into your apartment rental (including you), the last thing you want is for them to feel over or underwhelmed! The color in your home will greatly affect the mood that it elicits from all who enter, so get clear on what sort of energy you are trying to create and pick your paint color accordingly. White, for example, may make your space look bigger, but can also give a sterile and impersonal feeling. Certain shades of blue can evoke calm and tranquil feelings, while others may leave your guests feeling sad and down. Yellow can create an atmosphere that is bright and cheerful, however, if overused, can also create feelings of frustration. Taking color psychology into consideration can help you use just enough of your favorite colors to draw out the best in your guests. Your apartment rental is most likely not a penthouse suite. While space may be limited, there are ways to create the illusion of more space, the most important of which is to clear up your clutter. Leaving piles of paper, bills, and books about your apartment will impede on the visual appeal and can leave both yourself and your guests feeling stressed out and overwhelmed. A clean, clear space will lend the same to your psyche. A simple and easy step to create a cozier, more livable apartment rental is to invite Mother Nature in. Utilize natural light by keeping curtains raised during the day, open windows to invite in a breeze, and scatter plants and flowers throughout your apartment. If you don’t have a green thumb, invest in some silk plants and clean them regularly so they don’t accumulate too much dust. Unless you have rented in a brand new construction building, chances are big that there have been many previous tenants who have lived in your apartment rental. Clear out their energy and any odors that may have been left behind by bringing in some new, inviting scents. Find scented candles that make you feel safe, cozy, and warm, burn incense such as Nag Champa, Lavender, or Frankincense, or invest in a diffuser to burn some of your favorite essential oils. Invest a little extra cash on buying items that will be functional within your apartment rental, and still add to the décor. Look for cozy throw blankets and pillows, as well as fuzzy rugs and bath mats that are inviting both visually and physically. Creating an environment that is warm, comfortable, and welcoming within your apartment rental will rely heavily on the lighting you use. Overly dark and dreary apartments will provoke similar feelings from those dwelling there. If natural light isn’t available (such as basement apartments), spruce up your space by adding candles, floor or table lamps, or even string lights throughout to give a soft, warm glow to the rooms. Lastly, make your apartment rental your own by integrating the things that are most important to you. Put pictures of friends and family members on walls and shelves, and display the mementos that make you smile. For example, if you collect tea mugs, or flower vases, or shot glasses from your travels, find an interesting way to incorporate them into your design. If you are looking for the perfect apartment rental to call home, start with a visit to Hattiesburg Apartments. Whatever you are looking for, we are confident that we can take our over 35 years of experience to help you find the home that is just right for you. Check out our huge selection of properties today and contact us to get started. The coming New Year is a time to let go of the past, celebrate the present, and get amped up for the future, and there’s no better way to do that than surrounded by the friends and family that make your life what it is. Throwing a great New Year’s Eve party is an awesome way to join together and show them how appreciated they really are, but if you are living in an apartment rental, you may feel daunted by the lack of space or associated costs of hosting such a bash. Follow these guidelines and you are guaranteed to take away the stress and provide an atmosphere that will leave your guests talking about the success of your soiree for years to come. The number one way to ensure a fun-filled evening is to let your neighbors know in advance that you will be hosting a party. A happy life in an apartment rental requires courtesy between the people you share your walls with, so give them a heads up and ask if there are any requests they have that will make the event less invasive and distracting for them. A common misconception when throwing any type of bash is that you have to invite everybody you know. Life in an apartment rental may mean that your space can’t comfortably host every one of your social media pals, so get clear on who is on the non-negotiable list and stick to that. Having a smaller group of friends can actually contribute to an intimate atmosphere, keep costs down, and help alleviate some of the potential for noise complaints. The kitchen in your apartment rental may not be equipped to handle the kind of cooking required for your guest list. A surefire way to both cut down costs and alleviate some of the stress of throwing your party is to make it a potluck. Ask each of your guests to bring a simple dish that can be shared among the group. If you have that one friend that simply cannot cook (and we all have one), ask them to be in charge of providing disposable plates and silverware. Chances are good that, during your party, you won’t want your guests freely roaming about your apartment rental, so do your best to keep them confined to the main spaces. Move bulky furniture temporarily into your bedroom or other spaces you would prefer to be “off-limits” for the evening. This furniture shuffle can help to create extra space, and you may even decide to use these larger pieces to block off doors and re-route traffic. Much of the stress associated with throwing a party in your apartment rental comes from the mess that is often left behind. Plan to make this a non-issue by placing trash receptacles conveniently throughout the space and informing guests of their whereabouts upon entry to the party. Although spending the evening with a group of great friends is often enough to create a perfect party, having some interesting activities planned will keep the party going and help guests who may not know one another find a way to engage. Pick one area of your apartment rental where you can create and set up a resolution board. Ask each of your guests to write down one or two of their most important resolutions and pin or tape it to the board. It is sure to spark some interesting conversations. Having a special event planned for midnight is also imperative to making this a memorable moment. Remember that the dollar store is your best friend here, so costs don’t need to be astronomical. Consider providing your guests with party hats, confetti, or noisemakers. Perhaps you might like to take it a step further and offer your guests a champagne toast. Don’t forget to turn on the TV and watch the ball drop! The last piece to a successful New Year’s Eve party in your apartment rental is making sure that your guests arrive home safely. Have a list of cab companies and ride sharing services available for your guests to reference. You may even consider taking guests keys at the door and requiring that they receive a ride home. If there are guests who you know will not be imbibing, ask them ahead of time if they are available to drive a few of your guests who will be. Now that you have all of the components together to throw a great New Year’s party at your apartment rental, it’s time to kick off 2018 with a bang! If a new apartment is on your resolutions list, don’t hesitate. Contact Hattiesburg Apartments today and search our gigantic database of rentals in the area. With over 35 years of experience in the industry, we are certain we can help you attain the apartment that is perfect for your needs. The search for you very first apartment rental is a rite of passage for the majority of Americans. It signifies the transition into adulthood and the readiness to step up and embrace all of the new responsibilities and opportunities that it brings. A big part of this is the ability to add your own taste and flare to an entire space, truly making it your own. It can, however, be extremely easy to go overboard when shopping for your very first apartment. This can cause problems if you find yourself in an apartment that may not be able to accommodate all of your newly purchased items. To avoid this conflict, check out this list of suggested items to ensure that you have all of your basic necessities at move-in and save the extras for once you are all settled into the space. As you become more adjusted to your new kitchen, you can decide what other items are non-negotiable and what you have storage for. The bathroom in your apartment rental will be a place you will want to feel comfortable in, particularly at the end of a long day of moving. Make sure that you have all of the necessities to turn your bathroom into a makeshift spa. Hold off on buying shower caddies and organizational components until you are more familiar with the space and what your additional needs are. Couch, futon, or daybed (hold off on purchasing this until you have chosen your apartment and measured available square footage). Coffee and/or dining table (or some surface that can act as a table on which to eat). Floor lamp or other form of additional lighting. Getting these basic components in the space will allow you to see how much room you have available for additional items. Avoid buying your accent pieces until you know how much surface area you will have to display them (which will be based on the additional furniture you purchase) and what color scheme works best in the space. If 2018 holds the keys to your first apartment rental, the time to start searching is now! Find your perfect home today with the help of Hattiesburg Apartments. With access to our gigantic database of rentals in the area and our over 35 years of experience helping renters make their dreams come true, we are confident that we can help you find the right apartment for your needs. Happy Holidays to you and yours from Hattiesburg Apartments. It’s crazy to think that the holiday season is already upon us, yet here we are, greeted with festive lights, holiday parties, and the familiar sounds of Christmas carols at every turn. Getting into the holiday spirit creates a positive shift all around us, but if you are living in an apartment rental, you may find that you are coming up against some challenges in regards to how to draw this spirit into your own space. Fear not, renter…we have scoured the internet for you and come up with a list of the top ten creative ways that you can invite the holiday spirit into your home this season! With space often limited in an apartment rental, it’s important to make the most of each and every square inch. Why not start from the outside? Hanging a wreath, decorations, or even wrapping your front door in holiday paper is a great way to show your holiday spirit to your guests and passerby. You may even inspire your neighbors to do the same! If you don’t have lots of decorations to sprinkle about your apartment rental, don’t worry. Surely your mailbox will be inundated with cards from friends and family and these can be used in so many ways. Plaster the back of a door with them, hang them from the ceiling on fishing line, or make a border with them on your bathroom mirror. If you have had a tree in the past, chances are you have lots of Christmas ornaments just waiting to be used in new and creative ways. Add some festivity to your apartment rental by hanging ornaments in doorways or windows. If you are celebrating Christmas, chances are the holidays won’t feel the same without a tree. If you’re coming up against limited space in your apartment rental, consider getting creative. Draw or paint a picture of a Christmas tree and hang it on bare wall space, or find a scaled-down version in a pot that you can place on a tabletop or in a corner. Thoughts of the holidays often conjure up images of stark, white snow against freshly cut trees. Bring the outside into your apartment rental by hanging garland over cabinetry or existing furniture or hanging mistletoe in doorways. Add a little extra touch by affixing colored ribbons of red, blue, silver, or gold. If your apartment rental doesn’t come equipped with a hearth to hang your stockings, consider creating your own. Use your artistic skills (or those of a child, family member, or friend) and make a fireplace replica that takes up a small portion of your space or can hang on the wall. A super simple way to shift the environment of your apartment rental into the holiday spirit is to use what you already have. Rather than going out and buying a whole bunch of decorations, wrap your existing wall hangings in holiday paper and bows. Find pillows covers that will fit over your existing throw pillows, and consider hanging your most festive, fuzzy socks rather than investing in real stockings. These small changes add a personal, holiday touch with little to no cost to you. Another totally easy way to transform your apartment rental for the holidays is to get out your holiday dishes, and leave them out. Set your dining room table up like at any moment the turkey and fixings are going to appear and the holiday guests will be arriving. Although you may have to swap these things out at your regular meal times, you are sure to feel the festive spirit every time you see your dining area. Don’t limit yourself to the concept of visualization. Appeal to another sense by scattering scented candles throughout your apartment rental. Choose scents that evoke your own personal memories of the holiday, like Evergreen, Peppermint, or Balsam. Just because you don’t necessarily have an exterior to decorate in your apartment rental, does not mean that you cannot make the best of holiday lights. Think about framing your windows with strings of white or colored lights. Not only does it offer a cozy ambience to the interior of the apartment, but it also sends the glow of your holiday spirit to the outside as well. Are you ready to give yourself the gift of the perfect apartment rental? At Hattiesburg Apartments, we are fully committed to helping you find the apartment rental that suits all of your needs. With over 35 years of experience in property management, we deliver an unparalleled level of quality when it comes to the apartment living experience. Take a look at our huge database of available properties and start your search today! With 2017 drawing to a close, the year has proven that more and more people are renting over buying. In fact, according to CNBC, this past year has shown more renters than any time since 1965. What is it that is making the idea of renting sound so much more appealing these days? Read on to find out why living in an apartment rental may be the best choice for you. Although the cost of rent has been rising due to growing interest in the rental market, the cost of living in an apartment rental may still be far more affordable than committing to a mortgage. Without the added need of homeowner’s insurance and property upkeep, monthly expenses are less likely to fluctuate and it is easier to create a workable budget. Additionally, many leases include utilities as a part of the monthly rental fee. Even those that aren’t included are likely to run at a lower cost due to space. It will take far less electricity to heat and power a smaller apartment than it would a full-size home. Let’s face it…some of us are just NOT handy, and a lot more of us are just kind of lazy and have zero interest in maintaining a property. A big perk of an apartment rental is the fact that there is somebody else to do those things for you. If something breaks within the unit, you can just call the property manager. There’s no land maintenance either. You don’t have to worry about buying a lawnmower or keeping the garden weeded. One of the biggest perks about living in an apartment rental is the factor of safety. Most apartment complexes are equipped with security cameras or oftentimes even gated. Additionally, the fact that there are typically at least two units per floor, will make it much more difficult for somebody to get in and out of your property unnoticed, particularly if you make a pact with neighbors to keep an eye out for one another. Living in an apartment rental gives you direct access to many of the amenities you would wind up paying extra for if you were living in a single family unit. Most modern apartment complexes will offer their tenants access to gyms, pools, saunas, tennis courts, walking paths, and/or rec rooms. If you want to meet people, living in an apartment rental is a good way to do it. Not only are you sure to mingle with different people from different walks of life, you are also given access to lots of common areas that will draw people with similar interests. If you are a person who finds themselves weak in the knees at the thought of a long-term commitment, living in an apartment rental may be a great choice for you. Although most apartment leases run around 12 months, there are also many more options available these days. Some landlords are offering 6 month leases and some are even willing to operate on a month to month basis. Making the choice to live in an apartment rental vastly broadens the areas you may be able to afford, which can open you up to an entirely different way of life. You are much more liable to be in proximity to dining, shopping, nightlife, and public transportation when living in an apartment than you would be in a single family unit. Another huge perk of apartment living is less surface area to have to worry about cleaning! With home ownership comes the perpetual process of a weekly cleaning routine, but with apartments being smaller and more condensed, it is easier to get the job done as you go. Think about it this way…less space means less furniture (to dust), less counter space (to disinfect), fewer bathrooms (to bleach), and a much smaller floor (to sweep, vacuum, and mop). You’re welcome. When you decide on the location you’d like to be in and narrow yourself down to an apartment complex, your choices don’t have to stop there. Most apartment rentals offer their tenants a variety of floor plans to choose from. With all of the different availabilities, you are sure to find something that suits your needs! Life in an apartment rental can also help you keep the clutter to a bare minimum. With less space and surface area to cram up with knickknacks, apartment living can help you commit to a more minimalist lifestyle. If apartment living sounds like your cup of tea and you’re ready to find your next home, check out Hattiesburg Apartments. With over 35 years of experience in property management, we deliver an unparalleled level of quality when it comes to the apartment living experience. Take a look at our huge database of available properties and start your search today! If the thought of hosting a big holiday dinner in your tiny apartment rental feels daunting, I assure you that you are not alone. Since holidays began there have been apartment dwellers searching and striving for the best possible ways to accommodate a holiday dinner party. Luckily, that means that the footwork has been done for you. Sit back, relax, and check out these tips on a how to host your own successful apartment holiday celebration. Celebrations in an apartment rental can get more than a bit crowded. Get clear in your mind about how many people you can comfortably accommodate. Make it non-negotiable! Your cousin Sally, for instance, cannot invite her new boyfriend whom she has gone on two dates with and is kind-of, sort-of, pretty sure is the one. If he’s still around next year, maybe they can host the holiday dinner! Rearrange furniture in the main living area to create a larger space to place tables and extra seating. Consider moving any non-essential furniture temporarily into another room. Designate a drop zone for all of your guests to shed their jackets, purses, shoes, and other personal effects. There are so many fun and creative ways to turn your apartment rental into the perfect party pad. Don’t limit yourself to the confines of your apartment rental. If there is outdoor space available to you, consider moving the party (or some of it anyway) outside. Use space heaters to warm up patios and place extra seating to encourage visitors. Are you hosting kids? This might be a perfect time for a super fun picnic on the floor if you are short on seating. Designate a special space for it and spruce it up by placing out toys, crayons, and blank paper. The bathtub’s ability to double as cooler is an important hack you probably learned in college. Ditch your traditional coolers, clean the tub, get lots of ice, and pour in your drinks! Obviously when it comes to the holidays, food is a big factor! Cooking a holiday meal in a chef’s dream kitchen can be stressful, let alone in the limited space offered by most apartment rentals. Alleviate some of your anxiety by incorporating a few simple tricks here as well. Consider a potluck! As the host/hostess, offer to provide the main components of the meal, but invite your guests to contribute some of their holiday staples! Not only does it allow everybody to get involved, but it also takes some of the weight off of your shoulders. If there is limited oven space, ask your guests to please come with their dishes warmed and plan to eat shortly after your gathering begins. Serve your meal buffet style. Rather than worrying about how much mashed potatoes Uncle Henry wants, set up a walk through in your kitchen or another accessible area where guests can line up and make their own plates. Spread hors d’oeuvres throughout the apartment so that people can sit and chat as opposed to moving all over and giving you an anxiety attack. Provide paper or plastic plates, cups, and silverware to avoid a mile-high pile of dirty dishes at the end of the evening. Politely request everybody to dispose off their plates in a conveniently located trash receptacle when they are done with their meals. Rather than worrying too much about it, remember that good company is the most important factor in any good gathering. Enjoy your guests and they will enjoy you and your space. Are You Ready to Host the Holidays at Your Own Apartment Rental? As you can see, hosting the holidays in an apartment rental is not as terrifying as it seems. If you are looking for the perfect apartment rental to host your next big celebration in, check out Hattiesburg Apartments to begin your search. With our huge database of apartment rentals available in and around the Hattiesburg area, we are sure that we can help you find the space that is just right for you. Use our expertise and you are certain to be hosting your own holiday extravaganza in no time! If you’ve ever lived in an apartment rental, you have surely struggled with the issue of space, or should we say lack thereof. From tiny kitchens to cramped bedrooms to multipurpose areas, finding the right way to decorate, arrange, and accent can be a tricky procedure. Luckily, we’ve put together a few tips and tricks to help you make the most of your smaller apartment spaces so that you can enjoy the look and feel of a more spacious place to call your home. If there’s one thing that makes an apartment rental appear cramped, small, and unwelcoming, it’s a whole bunch of clutter. Whether it be shelving littered with tiny trinkets, a kitchen counter strewn with barely-used appliances (yes, we’re referring to the bread maker you received as a housewarming gift), or an unsightly stack of old magazines, an overabundance of any type of item are sure to make a space feel enclosed. Make it a routine practice to go through your things and discard anything that you haven’t used in the past six months. Clear countertops to leave only the everyday items you use. When it comes to decorating, consider storing the baubles and replacing them with larger accent items that will compliment the space without causing a lot of visual chaos. The simple act of keeping your space organized and tidy will do wonders for improving the feel of spaciousness. A lot can be said for the use of color in a small apartment rental. Stick with light or neutral color schemes on walls, as well as light or neutral furniture and accent pieces. If you’re eager for a pop of color, paint the ceiling a bright, inviting tone (with your landlords approval, of course) to encourage the eye to move upwards, creating the illusion of a taller space. Using different shades of the same color in a room can also add to the appearance of space. Nothing will make an apartment rental appear bigger than the use of natural light. Make the most out of windows by leaving them bare rather than installing drapes. If you are really compelled to put up drapes, consider a sheer option that will still allow the natural light to pour through. Don’t neglect your windows either. Keep the glass clean by making it a part of your weekly cleaning schedule. It is a common misconception that having large furniture in an apartment rental is a surefire way to make the space appear smaller, but that is not always the case. Oftentimes having one prominent larger piece in a room and other smaller pieces will make a space appear larger. You can compound on this by creating custom shelving that you can build around this larger piece. Make sure that couches and chairs are raised up on legs rather than resting directly on the floor, and choose tables with glass tops. Being able to see through or beneath them creates a light, airy, and open feel. Purchase multi-functional furniture such as pull-out couches or daybeds. Also consider dining tables that have removable leaves so that you can adjust when you have extra company. Find coffee tables and desks with hidden storage. Also consider finding a floor to ceiling bookcase. The height of the piece will again, draw the eye upwards, creating the illusion of taller ceilings. Another key component with your furniture is not getting stuck in the trap of pushing everything up against the wall. It can often be counterproductive to your intention. Play with pulling your furniture a few inches away from walls or using it to create multiple spaces within one room. Create visual space in your apartment rental by putting down rugs that are striped to give the impression of a floor that goes on and on. Use decorative mirrors strategically on the walls, particularly across from windows, to reflect the light and make your space appear larger. Find sheer shower curtains for tiny bathrooms. Just these simple things can drastically add to the feeling of space within a small apartment. Now that you know how to make the best use of the space within your apartment rental, it’s time to find the right place to put your new skills to the test. At Hattiesburg Apartments, we are dedicated to making your next apartment rental feel like the home you deserve. With our huge database of properties available, we are confident that we can help you find the apartment that suits all of your needs. Search through our properties today and reach out to us to get started. If you are finding yourself in search of apartments for rent, there is a good chance that you might also be looking for a quality roommate to share space and expenses with. Roommates can be an amazing way to cut costs and responsibilities, but can also lead to big problems if you aren’t prepared to deal with each other in an appropriate manner. It may sound like an exciting prospect to shack up with your best friend, but living with another person is sure to expose all of the flaws and differences you both have. Here is a guide to making living in an apartment with a roommate a bearable and (dare we say) enjoyable experience. Starting the roommate relationship out correctly is imperative, so let it begin right out of the gate when the search for apartments for rent begins. Be upfront about your pet peeves and what you expect from one another. Agree to keep the lines of communication open throughout your roomie relationship and to acknowledge issues as they come up in a mature and friendly manner. That being said don’t be the guy who constantly has an issue either. When you are looking for apartments for rent, there are sure to be associated costs with the property. Before you move in, go over these costs with your roommate to make sure that you know who is responsible for what expense. If you are splitting certain bills, consider writing up a contract that details what day payment is expected and who will be making the actual payment. Consider apps like Venmo or PayPal to make sharing expenses easier. Just because you are roommates does not mean that you have to spend every waking second together. There is such a thing as overkill, and being constantly on top of one another is sure to lead to eventual problems. Maintain your relationships with other friends and also, pencil in alone time. Get clear on one another’s schedule so that you can make sure to have your apartment to yourself once in a while to unwind, destress and have a little space. Sharing apartments for rent is all about compromise. Separate the big things from the little things and remember to leave a little wiggle room. For example, is it really that big of a deal if your roommate puts the toilet paper roll on backward? Think before reacting and remember that a peaceful roommate relationship is the key to happy apartment living. There will, however, be other, larger things that are non-negotiable. Have this tough conversation at the beginning of your roommate relationship to avoid potentially awkward situations down the road. If your roommate has a pet, for example, who is finding your living room rug equally as satisfying as a restroom as outside, you are likely going to have a big problem down the line. If you are constantly following him/her around turning off lights, eventually this could also lead to an argument. What if your roommate can’t come up with their end of the rent on time one month? Get a game plan in effect from day one to handle any issues you fear may come up. Living in apartments for rent comes with its fair share of housework. If one of you ends up doing all of it, you are sure to create some resentment between you. Discuss chores ahead of time and decide who will do what and how often it is expected to be done. When you decide on a roommate to share your apartment rental with, it is imperative that you be respectful to one another. If you plan on having friends, family or a significant other over, let your roommate know ahead of time. Don’t blast your music when they are sleeping or on an important phone call. Clean up after yourself. Remember that this is not solely your space and they have a right to be happy and comfortable here too. We’ve now come to the cardinal rule of living in apartments for rent. If it’s not yours, put it back! Remember that your roommate is working just as hard as you to earn money. Stock up your own food, toiletries, and cleaning products, or decide together what is shared property between you. Looking for Apartments for Rent in Hattiesburg? If you are starting your search for apartments for rent in or around the Hattiesburg area, let Hattiesburg Apartments work with you. With our team of dedicated advisors and a huge database of properties available, we are confident that we can help you find the apartment that suits all of your needs. Search through our properties today and reach out to us to get started. With the current rental market the hottest it’s been in ages, landlords are wielding more and more power when it comes to choosing their potential tenants. Apartments in Hattiesburg are modeling these trends, so it’s important that, as a prospective tenant, you are prepared to bring your A-game when it comes to moving through the rental process. From starting your search to move-in day, we’ve got you covered with tips and tricks to ensure that you land the apartment of your dreams. This may seem like a given, but it’s amazing how many applicants go through the process of searching for apartments in Hattiesburg without having a clue as to what their credit score is. Unfortunately, it’s not just a number…it’s THE number that your potential landlord is going to use to determine your eligibility to occupy their space. Pull your credit report before you begin your search and start the process of getting it cleaned up. If there are mistakes, work diligently to contact your creditors and have these mistakes removed from your report. Pay off outstanding debts as well and make sure you get written documentation proving that they are settled. This can be a time-consuming ordeal, so make sure that you give yourself at least 6-8 weeks so that creditors can have time to update your report. If time is not an option or you are not financially able to pay off your debt, make sure that you secure a reliable co-signer. If you’ve found a property that catches your eye and you are taking the next step and meeting up for a walk through, make sure that your first impression is positive. Dress professionally and bring a positive attitude. Invite only prospective roommates to view the property with you, or, if you will be living alone, bring along just one friend or relative. Your landlord wants to know who he/she is handing their keys over to. That being said, the first impression you are receiving is important as well. Make sure that you do a thorough walk-through of the property. Test out fans, lights, toilets, windows, faucets and appliances to make sure that everything is in working condition. Ask questions and request repairs where they are needed. Don’t assume that your landlord knows everything that is going on with the property. Remember that they weren’t the last ones living there. Apartments in Hattiesburg are a hot commodity, so show potential landlords that you are serious about their property by being prepared and organized. Make copies of your photo ID, credit report, proof of income, and pet certifications/vaccinations to accompany your application. It is also a great idea to write a rental cover letter introducing yourself and letting your potential landlord get some insight as to who you are as a person. Although it may seem like overkill, it is also a great way to help you stand apart from the crowd. Unfortunately, with a growing rental market, there is also an increased risk of encountering rental scams. When searching for the best apartments in Hattiesburg, it’s important to remember that if it sounds way too good to be true, it very well may be. Oftentimes scammers will lure potential renters in with deals that blow the competition away, gain access to their information through the application process, and even acquire money in the form of application fees, first and last month’s rent, and security deposits before the tenant is even aware that they have been scammed. Do your research and know who you are dealing with to help you successfully navigate the process. Once you’ve seen your fair share of apartments in Hattiesburg and chosen the one that is right for you, it’s time to move fast. Landlords don’t want to have their properties empty for lengths of time, so let them know that you are prepared to move in quickly. Have your current apartment packed up and ready to go, as well as a moving truck secured so that you can follow through with what you tell them. Be courteous during the move-in process, particularly if it is on a weekend. Ask your landlord where is the best place to park your moving truck to avoid creating a traffic jam for the rest of the neighborhood. Looking for Apartments in Hattiesburg? If you are starting your search for apartments for rent in or around the Hattiesburg area, let Hattiesburg Apartments work with you. With our huge database of properties available, we are confident that we can help you find the apartment that suits all of your needs. Search through our properties today and reach out to us to get started. If this is your first search for an apartment for rent, you may not know the ins and outs of how the landlord/tenant relationship works. It might seem as easy as finding your apartment, signing a lease, and paying your monthly rent, but what you don’t know could hurt you in the long run. Check out this list of 8 things that you probably don’t know about renting…and that your landlord is perfectly fine keeping you in the dark about. 1. How Private is Private? When searching for the perfect apartment for rent, privacy is something that you should probably consider. It might seem as if your space will remain undisturbed by others throughout the term of your lease but your landlord has rights you might not be aware of. Your landlord has an obligation to make sure that your apartment is safe, clean, and in a state of repair. This may mean, at times, hiring outside contractors for routine maintenance or repairs, or entering into your apartment themselves. Some may give between 24 and 48 hours notice before entering the rental apartment. After finding the right apartment for rent, you might be tempted to sign on the dotted line without much thought. Stop right there! Your landlord has likely set the price for your unit and they are under no obligation to disclose whether or not that price is fair. Do your homework by researching comparable properties in the area that have similar amenities and square footage. If you notice that your landlord is way above comparable rents, it might be time to jump to the next paragraph. For many of us, particularly new renters, we see an apartment for rent that we like and we sign the lease, no questions asked. You are not, however, necessarily obligated to accept the lease terms as they are spelled out in the original contract. This is particularly true if you are renting from an individual owner rather than a management company. If there are terms within your lease that are raising questions, sit down and discuss them with your landlord. Unfortunately in the world of rental apartments, there will always be that landlord who feels that they need to implement a no kid’s policy. Unknown to many, a landlord does not have the power of making such a decision. Landlords should not turn down tenants during the rental application process simply because they have children. This is according to the federal Fair Housing Act. As you move through the process of applying for an apartment for rent, you will probably notice that your landlord is asking you for a LOT of information. Most landlords ask tenants to submit a credit check and a criminal background check. It might seem as if like the scales are tipped in the landlords favor, but there are some tools you can implement to learn a bit about them too. Ask current tenants for feedback, google your landlords name, check online apartment ratings, or search for any notices of default. If you’re searching for your next apartment for rent and you are shown a property that feels a little iffy, you may be onto something. Some “apartments” are actually not legitimate rental properties at all. Landlords advertise them as such to make extra income. Contact your city’s building safety department and pull records on the property to determine how many apartments should be available. If the complex shows 20 units and you are being shown a number 21, that’s a good indication that you are being misled. Signing a lease on an apartment acknowledging that you accept it “as-is” does not mean that you are destined to live in squalor. Of course, the conditions that determine “livable” space cannot be the same for all states, but it definitely pays to know when your apartment is being neglected. If you feel that a complaint has gone unresolved, reach out to other renters within your building who might be experiencing the same problem. There are also several tenant advocacy groups throughout the state who resolve landlord-tenant related issues. Sometimes just having others to back you up will be enough to get the ball rolling. Looking for an Apartment for Rent in the Hattiesburg Area? If you’re starting the search for your next apartment rental in the Hattiesburg area, work with the best. At Hattiesburg Apartments, we offer the largest variety of apartment rentals in the area. Search through our properties today! Rents fluctuate from time to time in every city. Staying up-to-date with these fluctuations is very critical. When you are moving for instance, you could take advantage of a short-lived decline in the average rent of a given city. Apartment List’s Rent Reports cover rental pricing data in major cities, their suburbs, and their neighborhoods. Read through the excerpt below and click on the green button to view the rest of the National Rent Report. Apartment List is committed to making our rent estimates the best and most accurate. As part of our efforts towards that goal, we’ve recently made some changes to our methodology. Data from private listing sites, including our own, tends to skew towards luxury apartments, introducing sample bias. In order to address these limitations, our estimates now start with reliable median rent statistics from the Census Bureau. These then extrapolate forward to the current month using a growth rate calculated from our listing data. In calculating that growth rate, we use a same-unit analysis similar to Case-Shiller’s approach. This approach only compares those units that are available across both time periods. As a result, it provides an accurate picture of rent growth in cities across the country. We are continuously working to improve our methodology and data, with the goal of providing renters with the information that they need to make the best decisions. You can read more about our new methodology here. Welcome to the October 2017 National Apartment List Rent Report! Our national rent index is down 0.1 percent month-over-month, marking the first time since January that we’ve seen rents fall. After increasing by 3.1 percent through the first eight months of the year, our national rent index fell by 0.1 percent between August and September. This is the first time that we’ve seen a rent decrease since January. Year-over-year growth is currently falling in between the levels from the two prior years. Rents began to flatten last month, with our national index posting the smallest monthly gain since January, and now growth has actually turned negative. 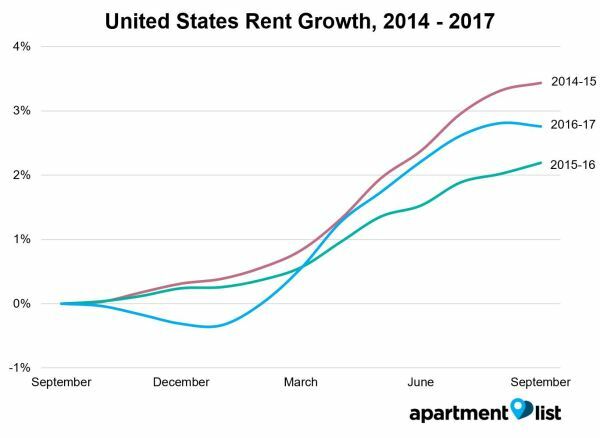 The fall and winter months are generally the off-season for renting when we tend to see lowered growth, but it’s rare to see rents fall, even by a small amount. Going back to January 2014, this is only the fifth time that our national index has decreased month-over-month, with the other four months of negative rent growth occurring during the slump at the end of last year. Despite the decrease over the past month, rents are still up 2.8 percent year-over-year at the national level. Year-over-year growth is currently falling directly in the middle of the 2.2 percent rate from this time last year and the 3.4 percent growth rate from October 2015. Year-over-year rent growth continues to pace ahead of the overall rate of inflation, which stands at 1.9 percent as of the latest data release. Rents are also growing slightly faster than average hourly earnings, which have increased by 2.5 percent over the past twelve months. There are a couple reasons why you may choose to lease out your rental property. For one, You could be the owner of several properties and decide to rent out a couple of them, instead of letting them lay idle. You could also be a struggling home owner and decide to rent out a room just to make ends meet. Either way, you need to ensure that your rental property remains safe. Everyone would want a win-win situation- income at the end of the month, and with no property damages accrued. Our friends at apartmentshattiesburg.com published an informative blog post showing you how to successfully lease out any of your rental properties. Read through the excerpt below and click the green button to read the entire post! With renting becoming increasingly popular throughout the country, many people are turning their homes into an income-generating rental property. Have you been considering this? If yes, it’s important to get clear on the ins and outs of becoming a landlord. We’ve all heard the horror stories of terrible tenants so save yourself the potential trouble and do it right the first time by following these simple steps. Perhaps you are considering turning a second home into a rental property. You could also be looking to rent out your primary residence or even just a bedroom within it. There are a few reasons why any of these would be a great decision. Perhaps the market has taken a turn or you owe more on your property than it is worth, leaving you unable to sell. Maybe you have a second property that is being largely unused, or you have been transferred temporarily out of town. In any case, rather than leaving your property sitting vacant, it can be a great idea to find a tenant. A good tenant will help you to cover the expenses associated with the property. He will also deter looters, help with the upkeep, and hopefully contribute to your monthly cash flow. The idea of additional income is the most common reason you might convert your property into a rental property, but being a landlord takes a lot of responsibility. Your new role will include repairs and maintenance to the property, showcasing the property, collecting rents, screening, accepting, and potentially evicting tenants, ensuring that the tenant is following the terms of the lease and the HOA, if applicable. Make sure that you are up to the task before you take the next steps. Now that you’ve established your own preparedness, it’s time to get your property up to speed. Take a look around your existing rivals (similar rental properties in the area). Notice what amenities are being offered to potential renters. Based on what you find, you can assess your own property and decide what repairs and upgrades need to be made. The tough part about this is remembering not to go overboard. You will need to take into consideration whether or not the money you sink into the property will be offset by the rental income you will be able to recoup. You may want to hire a professional cleaning company to come in once it’s all said and done to ensure that your property looks its very best for potential renters…. The thought of buying your very own home can be both intriguing and overwhelming all at once. Maybe you’ve spent your entire life imagining all of the tiny details that your dream home will have. Initially, deciding whether to start looking for apartments for rent or take the big step into homeownership can be mindboggling. First off, relax…your hesitation is perfectly normal and believe it or not, even healthy. Making the decision to move from renting to buying is a huge commitment. We’ve often heard the benefits of homeownership. Are there any benefits tied to a rental property as well? Being well-informed ensures that you to make the decision that is best for YOU! When making the transition from apartments for rent into properties for sale, the first step is to check out your cash situation. Homeownership is a long-term investment so being clear on your finances is extremely important. There are a few key points you may want to consider. Account for your up-front costs. If you are a first-time potential homebuyer, you may not be fully aware of what is expected of you before and at your closing. Most sellers will require a good faith deposit to even consider your offer. Combine this with the costs of your appraisal, inspection, down payment, and first-time homebuyers insurance (if required by your lender), among others, and things start to add up quickly. Get familiar with your credit score. Fixing your credit can be a long and tenuous process and is an integral part of home buying. If you don’t have a decent credit score or a co-signer, now may not be the time for you to make the transition into home ownership. Spend some time paying off bad debts to raise your credit first. One of the luxuries of searching for apartments for rent is the vast array of models and locations available to you. With relatively short rental agreements, you won’t find yourself locked into one place very long. Homeownership, however, is a much longer commitment. There are a couple key questions you may want to ask yourself here. How long do you plan on staying? If you have a job that frequently causes you to relocate or a free spirit that finds you regularly on the hunt for new scenery, homeownership may not be for you. What will the costs of re-selling your property be if you do decide to relocate? This is a question that’s often overlooked. We tend to see only the potential profit in home ownership and crunch the numbers associated with the initial purchase, but selling has many associated costs as well. If you’ve crunched the initial numbers and determined that you’re more likely to stay in one location than to relocate, there’s still one more avenue you should check out before leaving behind the world of apartments for rent and jumping into homeownership. Although we have no way of being prepared for everything the future may bring, it’s important to factor in the possibilities. There are many long-term costs associated with homeownership. The excitement of your initial purchase eventually wears off often replaced with the reality that you are now solely in charge of your property. There will be no landlord to call if the air conditioner breaks or the appliances go on the fritz or your house floods. There will be nobody to take care of landscape maintenance either. Unexpected life changes can occur at any time. It’s important to make sure that you have a reasonable cash reserve. Set aside some cash for unforeseen events such as illnesses, job loss, and change in career. Life changes and so do you. Before making this giant transition, you have to consult your future self. What is the likelihood that he/she will be happy with your purchase decision later down the line? Think about the changes you are going throughout the course of your homeownership. Do you have the means to make those changes reality and the patience to have it like it is currently? Looking for Great Apartments for Rent in Hattiesburg? So maybe you’ve read through this and there are a few things you still need to consider. Working with a skilled rental property manager comes in quite handy. At Hattiesburg Apartments, our team of accredited property managers is determined to make your rental experience a success. Search through our properties today! Everyones dream is to rent an apartment that feels like a true home. It’s usually the simple things that makes it feel that way- the smell of fresh air, the sound of a distant river or even the distant sound of playing kids to mention a few. Inasmuch as everyone likes change, we would all prefer the norm when it comes to the surroundings. A homey feeling helps you re-live some of the most treasured childhood memories with your own family. It also helps prevent distress to some extent. Our friends at Multifamily Executive did a comprehensive post about this. Read through the excerpt below and click on the green button to read the rest of the post. It’s no surprise that price and location are the two biggest factors for most renters in determining their next place to live. Even so, the first National Renters Index survey by Detroit-based property management company Village Green proved otherwise. Respondents indicated they want to live in a community that feels like a true home. High-end property amenities (52%), such as upgraded kitchens and bathrooms and hardwood floors. The first Village Green National Renters Index was conducted online. 1,000 respondents were surveyed in seven markets across the country (Atlanta, Chicago, Dallas, Detroit, Minneapolis, Phoenix, and Philadelphia). The survey was performed using SurveyMonkey and Research Now polls in February and March 2017. All participants had to be active renters in a residential property. The Pew Research Center identifies the millennial generation as people born between 1981 and 1997. Generation X refers to people born between 1965 and 1980. The baby boomer generation includes people born between 1946 and 1964. The index also asked where renters are looking for referrals and reviews as part of their search for their next home. Notably, 45% of renters said using third-party rental websites was important for their search, while 40% mentioned online review sites as key resources and influencers for their housing hunt. While reflecting on those figures, Village Green pointed to the increasing importance of effective social media strategies, both proactive and reactive. Whether you are a first-time renter or a seasoned pro, it can be difficult to remember all of the questions you want to have answered when you are on an apartment rental tour. That being said, failure to dig a little deeper and ask the important ones can lead to renters regret later down the line. Consider getting together a checklist to take with you as you tour potential rental properties. To get you started, here are some commonly forgotten queries that shouldn’t be left out. 1. How do you pay your rent? This might seem like an obvious one, but knowing the details of your apartment rental payment policy is imperative to successful renting. It’s not just about how much rent is or when it is due, but also where it gets paid, which forms of payment are accepted and whether or not there is a grace period in case of a late payment. 2. What is included in the cost of your rent? Finding the perfect apartment rental can feel like a sigh of relief unless you enter into an agreement without a full understanding of what your rent covers. Ask if your electric, cable, internet, and other utilities are included in your rental fee, or if these will be additional out of pocket expenses. 3. What does your security deposit cover? There’s nothing quite as bad as getting hit with an unexpected expense, particularly at the end of your apartment rental lease when you are hoping to receive money back from your deposit. Getting clear on your responsibilities as a renter will help to ensure that you do, indeed, get your deposit back in full. 4. How safe is the property? Not all apartment rental properties are created equal when it comes to safety. Beyond the location of the property, you should also ask about maintenance of fire alarms and proximity to local law enforcement. Safety within your apartment rental is even more important. Be sure to inquire under what circumstances apartment complex employees are allowed to enter your space without notice. 5. Should you get renters insurance? Although the majority of apartment rental complexes won’t require this, some may and others yet may recommend it for your own benefit. 6. What are you allowed to do within the apartment space? Imagine that you finally sign the lease for your new apartment rental, only to find out that you are stuck with the drab, white, unadorned walls. Knowing what’s acceptable when it comes to decorating your new space can have a big effect on whether or not you will be happy there for the length of your lease. Painting and hanging pictures are small acts that make a big difference. 7. Does the apartment complex have plans to renovate in the near future? The potential renovation of your apartment rental complex is important for a couple of reasons. For one thing, there will be the potential for increased noise and construction debris. On the flip side, it could mean better amenities down the line and become further incentive to rent. 8. What is the policy on overnight guests? This will vary from one apartment rental to another and should be clearly outlined in your lease. Many complexes have a two-week cap on overnight guests or require long-term guests to be registered with the office. There might also be limits on where they can park. Getting clear on this will help to keep you from accidentally breaking the terms of your lease. 9. How are necessary repairs handled? Things break…sometimes at the least convenient moments. Knowing the process of reporting needed repairs to your apartment rental landlord is extremely important. Ask about what the leasing office hours are and who you would go to in the case of something breaking. Be sure to clarify how the process will be different if there is an emergency repair needed, perhaps in the middle of the night or the weekend. 10. What happens when you are ready to terminate the lease? Whether the lease has come to an end and you’ve decided not to renew, or something has happened to cause you to break the lease early, this is a critical point to get clear on. Does the complex require a notice of non-renewal and if so, how far in advance? What is the penalty for breaking your lease? Do you have the ability to sublet the apartment in case things change? Looking for an amazing apartment rental in Hattiesburg? With SVN | Southgate Realty by your side, finding an apartment rental that checks all the boxes is super-easy. We have 17 amazing communities to show you, each featuring spacious floor plans, upgraded finishes, great location and unmatched amenities. Contact us today to get your search started and check out all of our beautiful properties! There are always pros and cons to renewing an apartment lease. One of the cons, at the moment, is that apartment rental rates are on the rise. However, Apartments Hattiesburg has recently published a blog post that shares five reasons why you should renew your rental apartment. Most of the reasons center around the concept of how you may be saving money, by staying where you are. One of the reasons centers around the benefits of renting from a good landlord and having good neighbors. You never really know what a new landlord or neighbors will be like! The excerpt below will give you an idea as to why you should renew your lease. If you like the excerpt, please feel free to click the button at the end of the post, to read the full article! Oct 24 2017 2:05PMThe cool thing about being a renter is the vast array of options available to you when it comes to your home. For some renters, the lack of commitment to anything longer than a 12-month lease can be extremely intriguing, but for others, the thought of picking up and moving can feel like a daunting task. However, with rental apartment prices on the rise throughout the country, more and more tenants are being faced with the big decision of whether or not to renew their rental agreements. The reasons not to renew seem glaringly obvious, but let’s take a look at a few of the perks of remaining where you are. With the constantly increasing demand for a rental apartment in a good neighborhood and with prices on the rise, your location may be enough of a reason to stay put where you are. Even when facing a rental increase, take into consideration the neighborhood characteristics which made this location so intriguing to you in the first place. You may want to consider your proximity to work, nightlife, grocery stores, etc. Moving even just a few miles away could offset your travel costs enough that it might make more sense to face the rent increase and stay put. Not to mention, if you’ve fallen in love with your location, you may find that the next place just isn’t going to be comparable, no matter what the cost. If your rental apartment offers amenities that you find yourself using frequently, this could be another factor to determine whether or not you should stay put. If you start each morning at the community gym and spend your weekends lounging by the community pool, these may not be comforts you are willing to give up, particularly if they are….